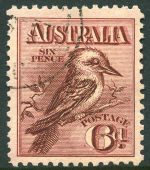 1914 6d Claret Kookaburra MUH well centered marginal copy with tiny natural gum inclusion. 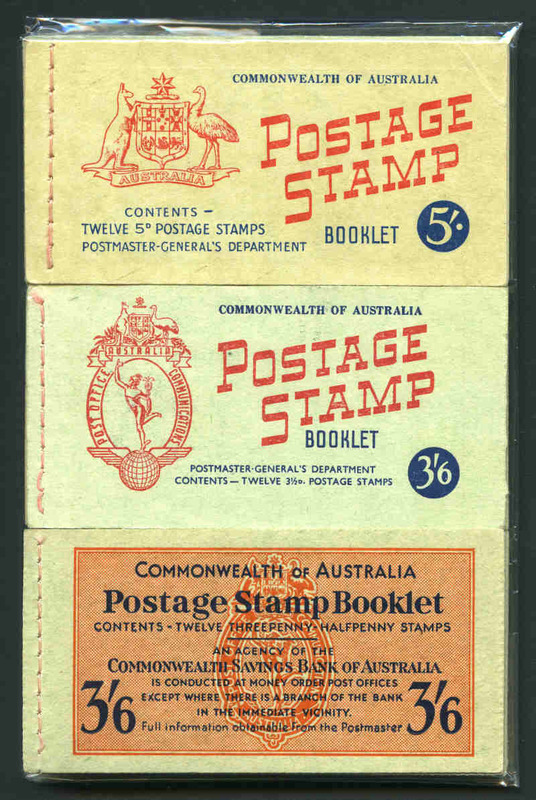 1914 6d Claret Kooka, 1927-30 1½d Canberra, 3d Kooka, 3d Airmail Type B and Sturt set perforated OS, 1928 3d Kooka, 1929 3d Airmail Type A, 1931 Kingsford Smith set, 1931 2d and 3d Kingsford Smith O/P OS, 1931 6d Brown Airmail, 1932 1/- Lyrebird O/P OS and 1934 1/- Perf 10½ Vic Centenary, all with G.P.O. Melbourne CTO postmark with gum. 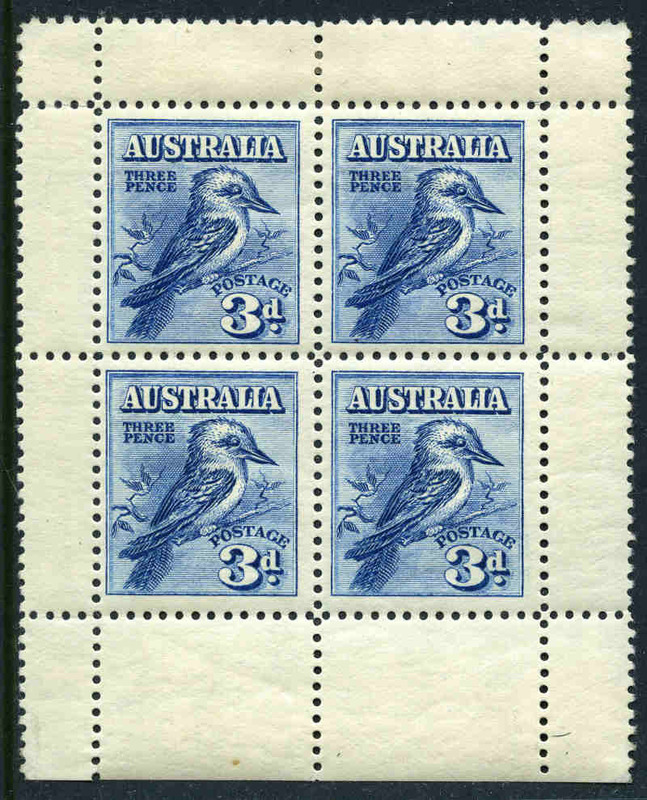 Mainly hinged, the 3d Sturt without gum. Odd shortish perf. 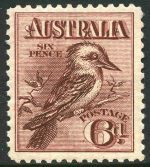 1914 6d Claret Kookaburra MUH and reasonably well centered. Minute spot on gum. 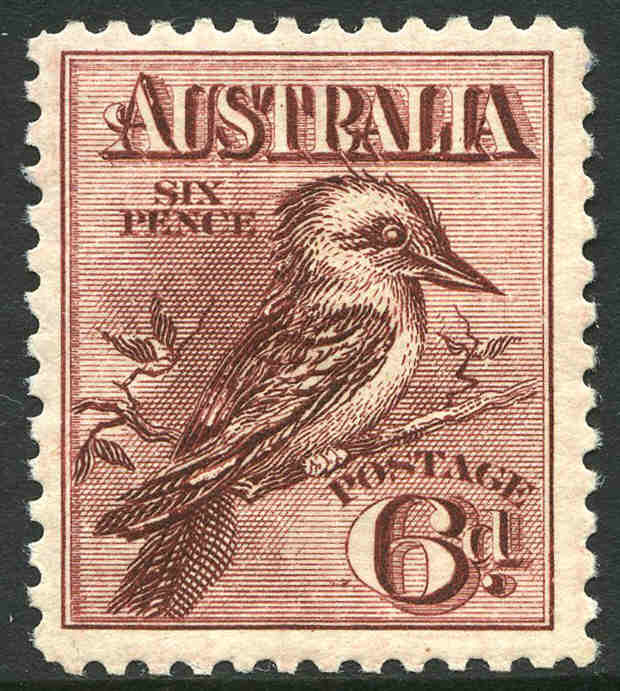 1914 6d Claret Kookaburra CTO without gum and well centered. 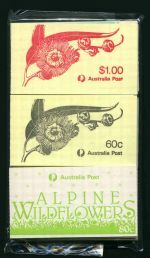 1914 6d Claret Kooka, 1935 1/- Anzac, 1938 10/- and £1 Thick Paper Robes and 1950 £2 Arms MLH. 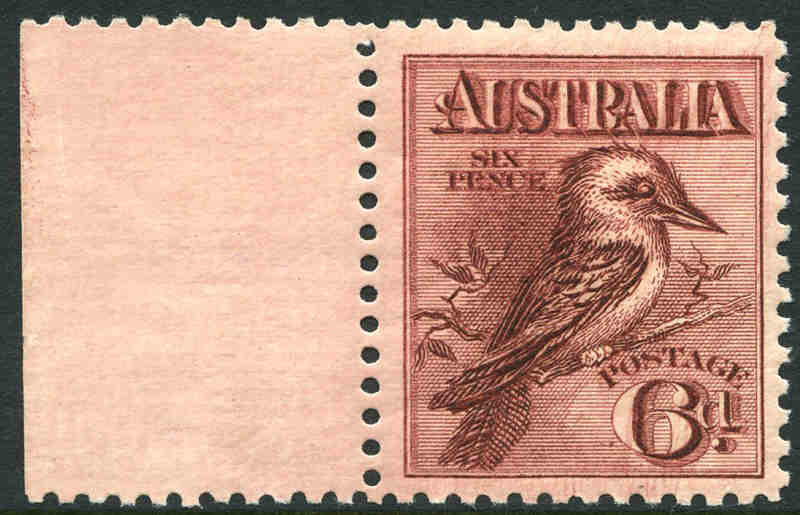 6d Kooka centered to left, others reasonbly well centered. 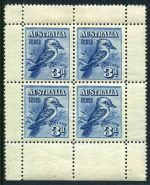 1914 6d Claret Kooka, 1927-30 1½d Canberra, 3d Kooka, 3d Airmail Type A, 1½d WA Centenary and Sturt set perforated OS, 1928 3d Kooka, 1929 3d Airmail Type B, 1929 1½d WA Centenary, 1930 3d Sturt, 1931 Kingsford Smith set, 1931 2d and 3d Kingsford Smith O/P OS, 1931 6d Brown Airmail, 1932 1/- Lyrebird O/P OS and 1934 3d and 1/- Perf 10½ Vic Centenary, all with G.P.O. Melbourne CTO postmark with gum. Mainly hinged and odd shortish perf. 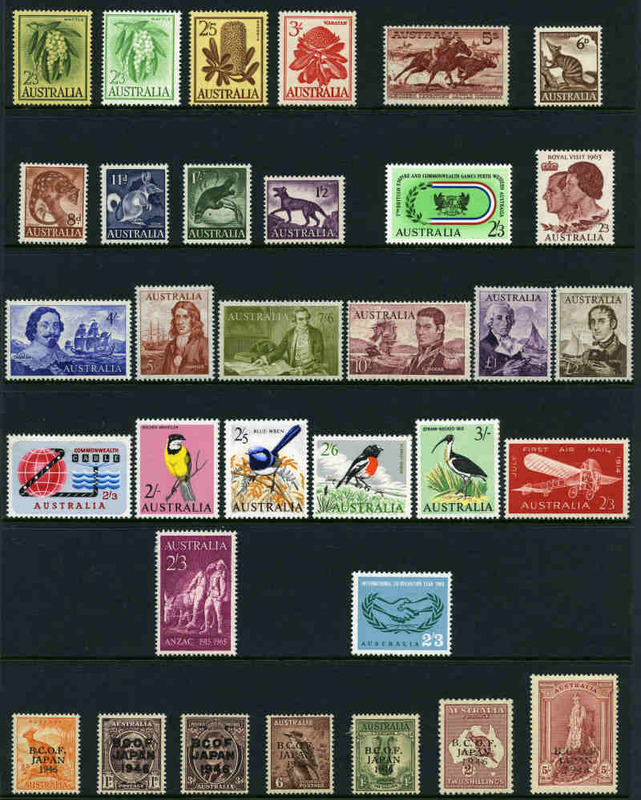 Collection of 104 different mint Pre-Decimal issues from 1914 to 1965 including 1914 6d Claret Kooka, 1931 6d Brown Airmail O/P OS, 1932 1/- Lyrebird, 1932 1/- Lyrebird O/P OS, 1934 Perf 10½ Vic Centenary set, 1934 Macarthur set, 1935 Anzac set, 1935 Silver Jubilee set, 1936 1/- SA Centenary, 1938 Thick Paper Robe set, 1946 BCOF set, 1961 5/- Cream Paper Cattle and 1963-64 Navigator set of 6. Generally fine MLH condition with odd minor fault. High retail value. 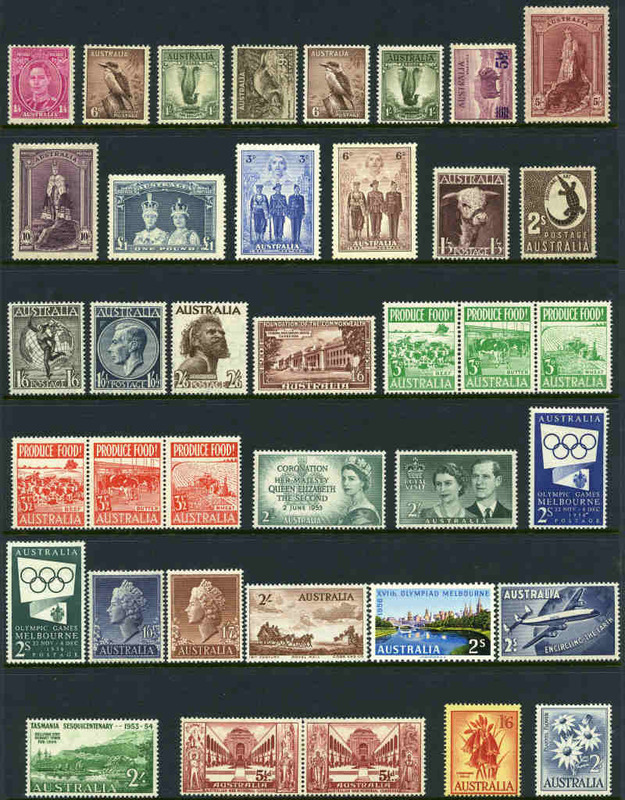 Collection of 249 different mint Pre-Decimal issues from 1914 to 1965 including 1914 6d Claret Kooka, 1931 6d Brown Airmail, 1932 1/- Lyrebird, 1934 1/- Perf 11½ Vic Centenary, 1934 Macarthur set, 1935 1/- Anzac FU, 1935 2/- Silver Jubilee FU, 1936 SA Centenary set, 1937 NSW Sesqui set, 1938 Thick Paper Robe set, 1940 AIF set, 1961 5/- Cream Paper Cattle and 1963-64 Navigator set of 6. Generally fine condition with some minor faults and several issues MUH. High retail value. 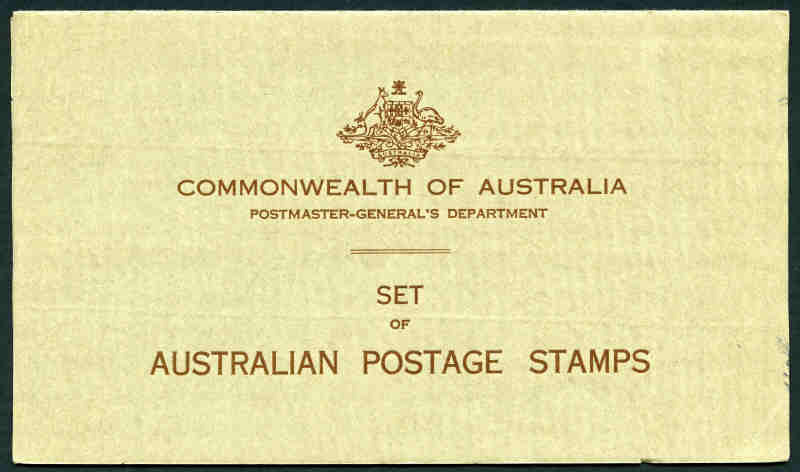 1927 1½d Canberra booklet MUH. Back cover with minor fault. 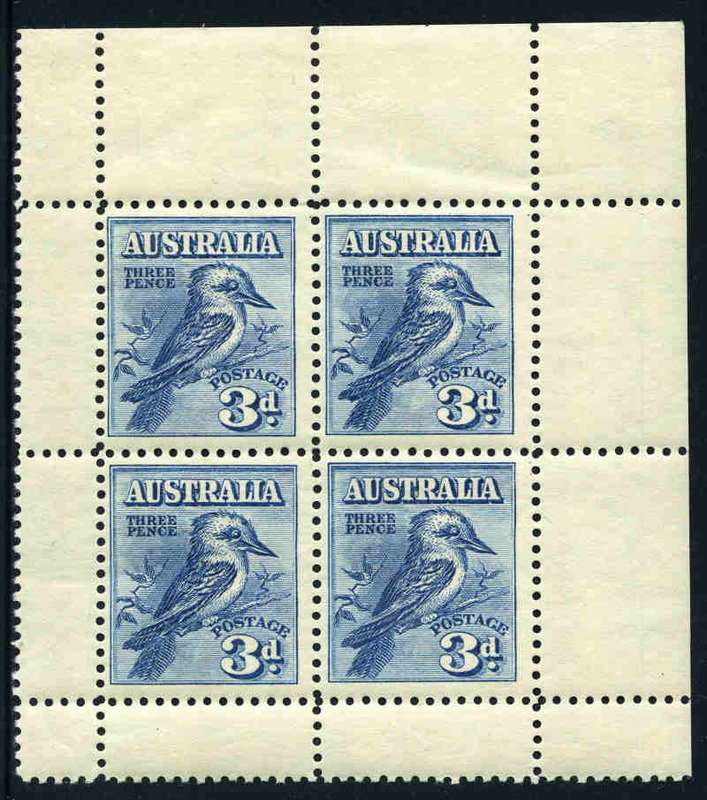 1928 3d Blue Kookaburra M/S MLH and well centered with tiny gum thin in each corner. Visually attractive. 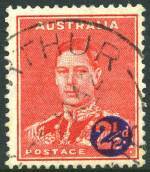 1931 Kingsford Smith set MLH. 3d value is centered to base. 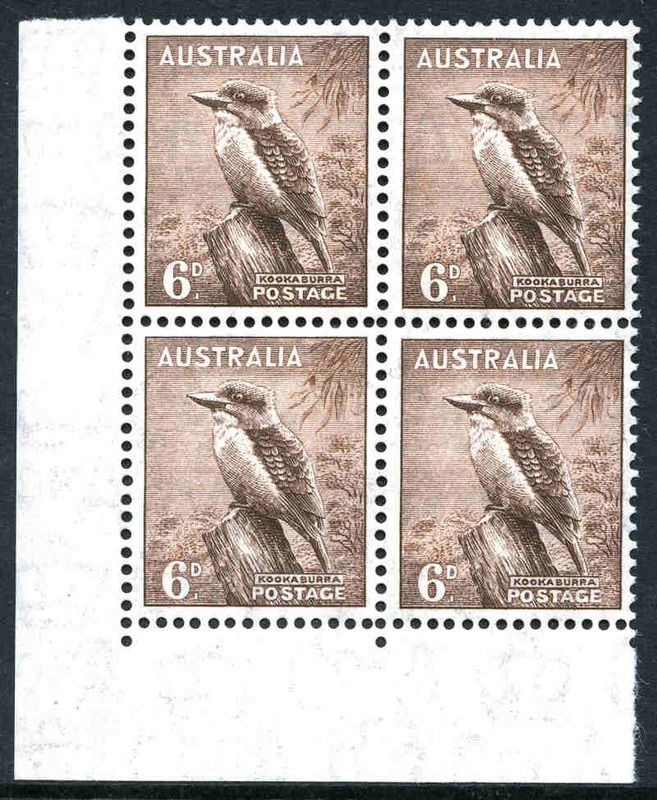 We are of the opinion that the overprints are genuine. In accordance with our conditions of sale the buyer can apply for an extension, to obtain a certificate and we encourage the purchaser to do this. 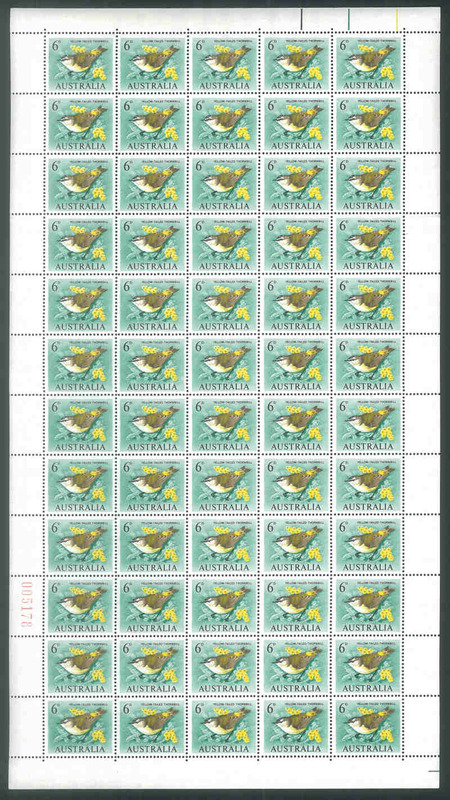 1931 6d Brown Airmail O/P OS complete sheet of 40 MUH and well centered with Re-entry to "STRALIA" and plane's wing at right variety. 2 units marked on gum. Retail $1,400.00+. 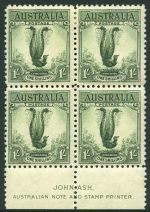 1932 1/- Green Lyrebird imprint block of 4 mint hinged on top units and lower units MUH. 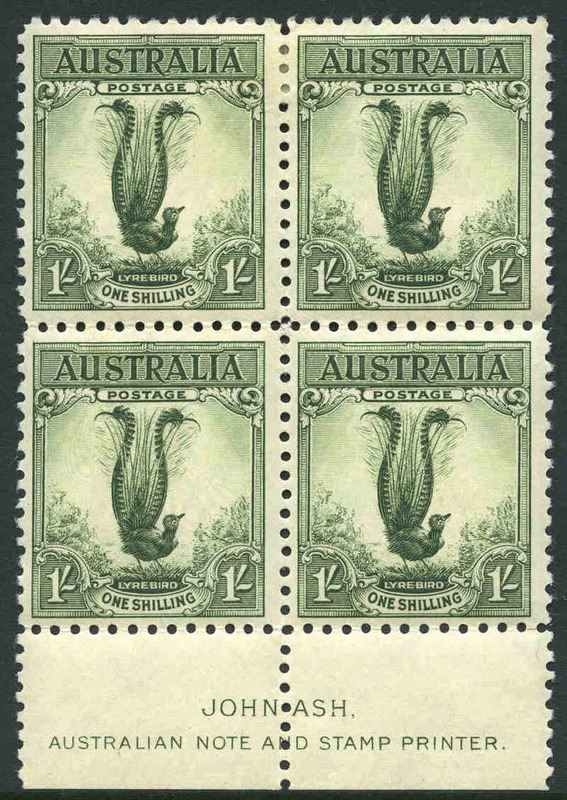 1932 1/- Green Lyrebird marginal block of 4, lightly hinged on upper units, the lower units MUH. Centered slightly high. 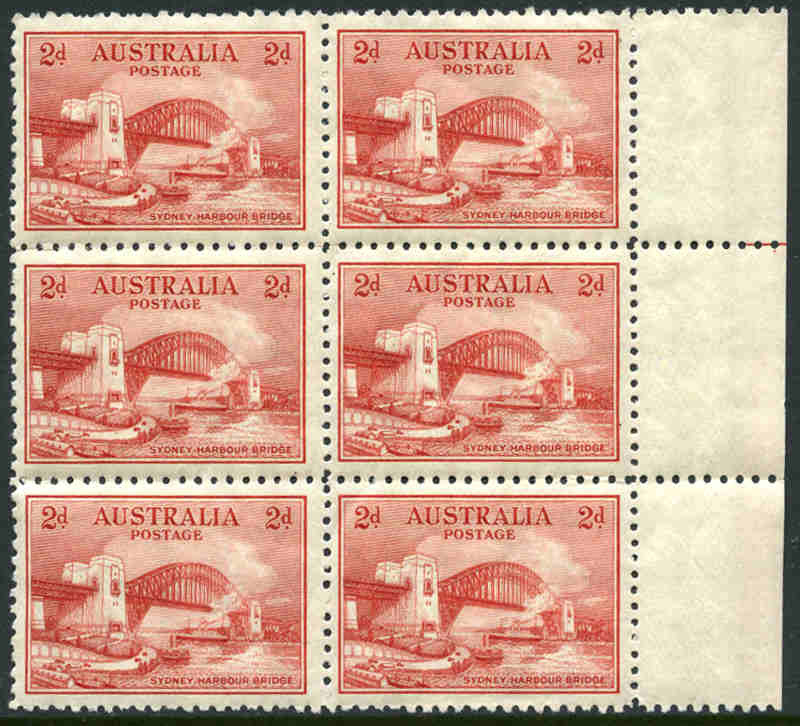 1932 2d Carmine-Red Engraved Sydney Harbour Bridge Plate two dot right side sheet of 80 MUH and well centered. Several units with light creasing, not affecting Plate block. Scarce. ACSC 146zb. 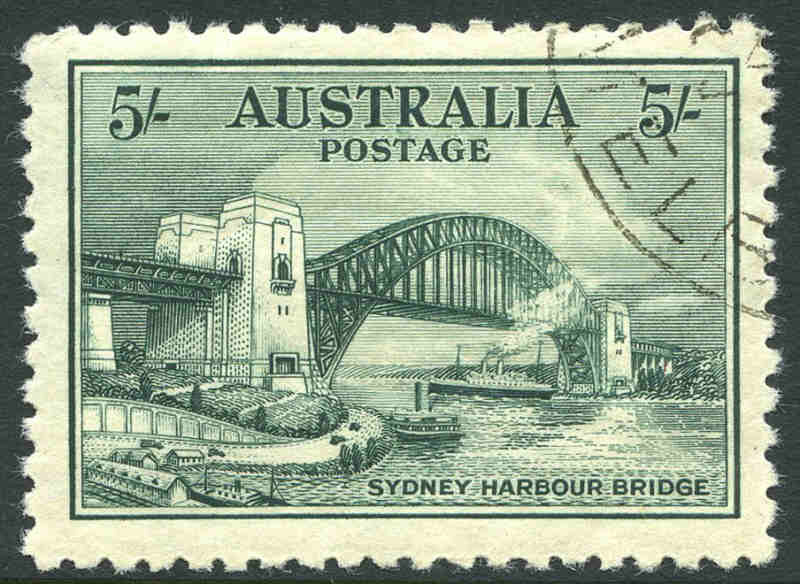 1932 5/- Green Sydney Harbour Bridge MUH and centered slightly to left. 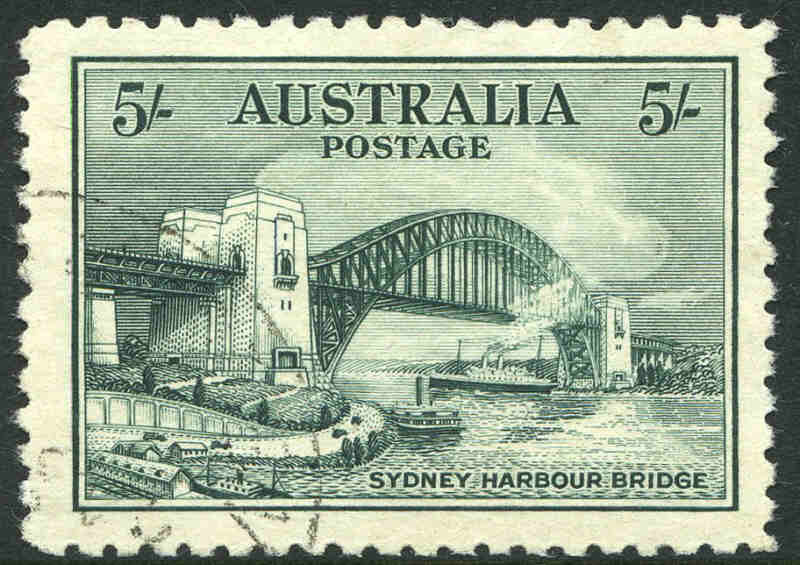 1932 5/- Green Sydney Harbour Bridge MUH and centered to left with light crease in lower right corner. 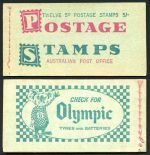 1932 5/- Green Sydney Harbour Bridge imprint strip of 3 MUH and reasonably well centered. Left unit MVLH with natural paper imperfection at base. Lovely fresh appearance. 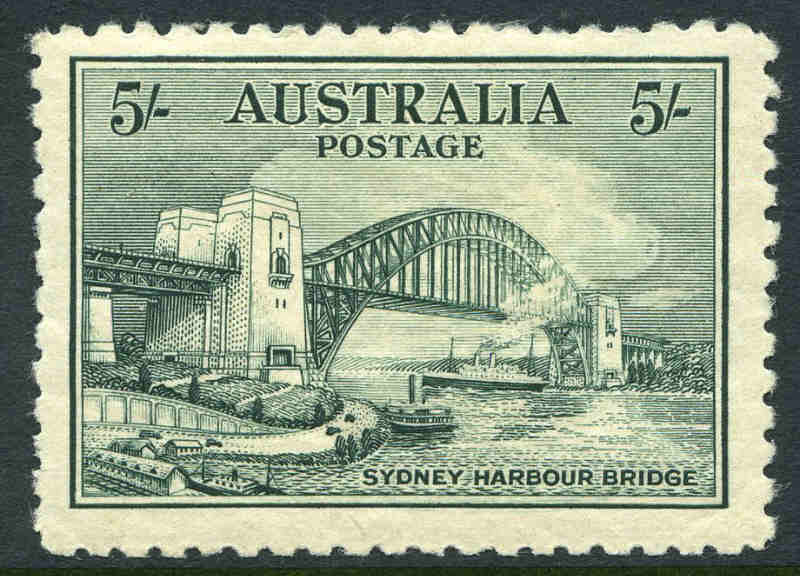 1932 5/- Green Sydney Harbour Bridge MLH and well centered lower left corner copy. Rough perfs at right. 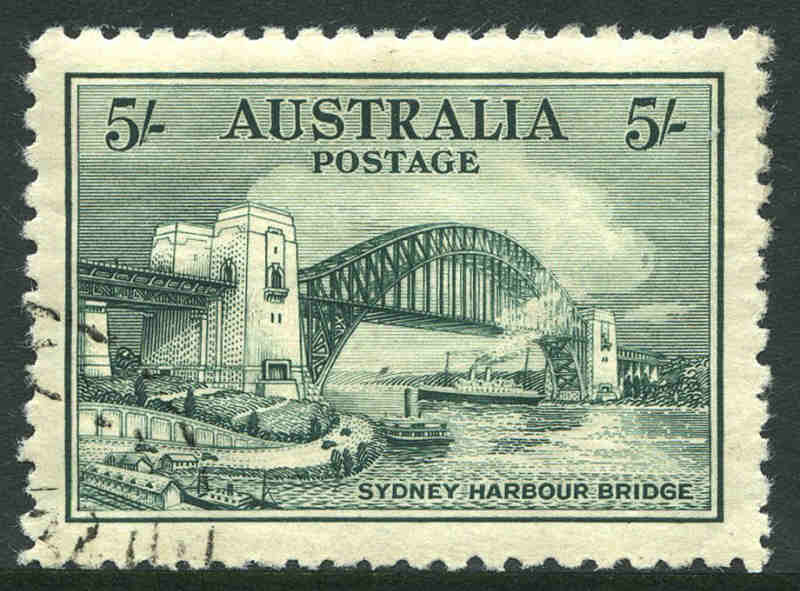 1932 5/- Green Sydney Harbour Bridge MLH with a few bluntish perfs. 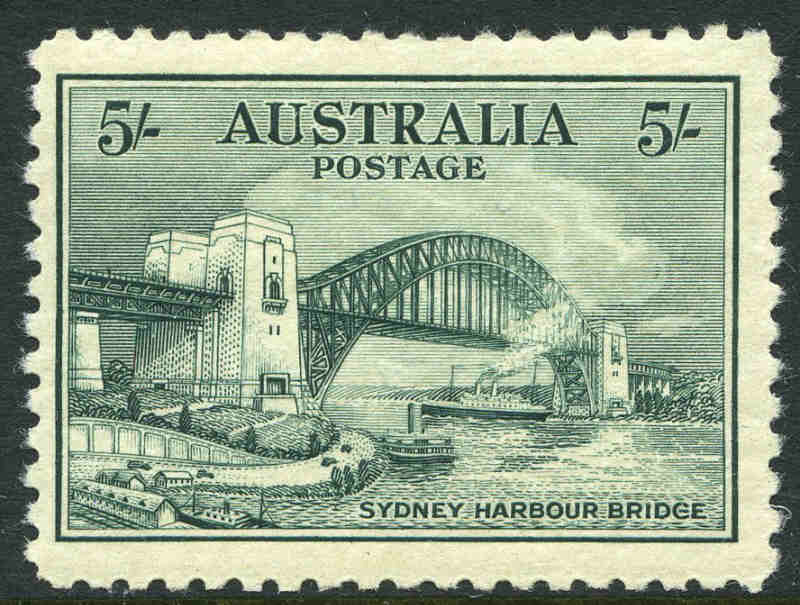 1932 5/- Green Sydney Harbour Bridge with Retouch over centre of bridge variety mint without gum and centered to left. Badly thinned, but visually attractive. ACSC 148d. 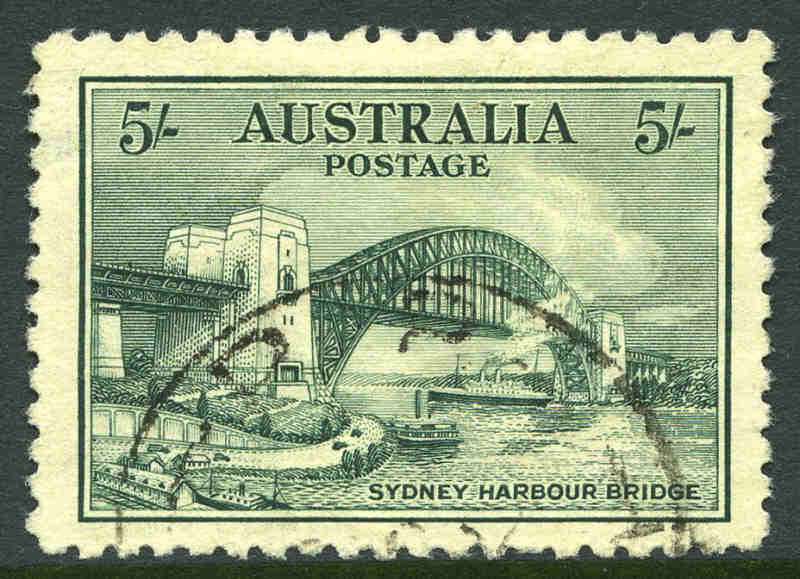 1932 5/- Green Sydney Harbour Bridge with Retouch over left centre of bridge variety CTO with gum and superbly centered. Few shortish perfs hardly detract. ACSC 148e. 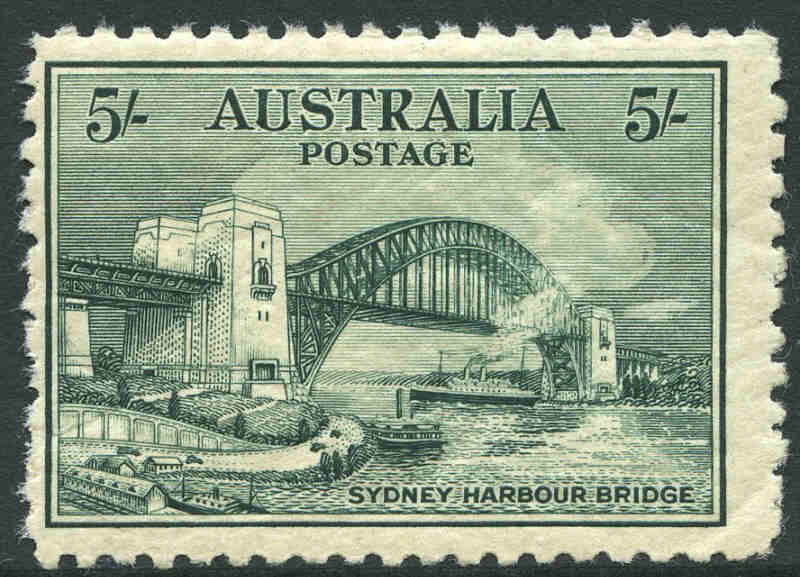 1932 5/- Green Sydney Harbour Bridge CTO with gum and well centered. 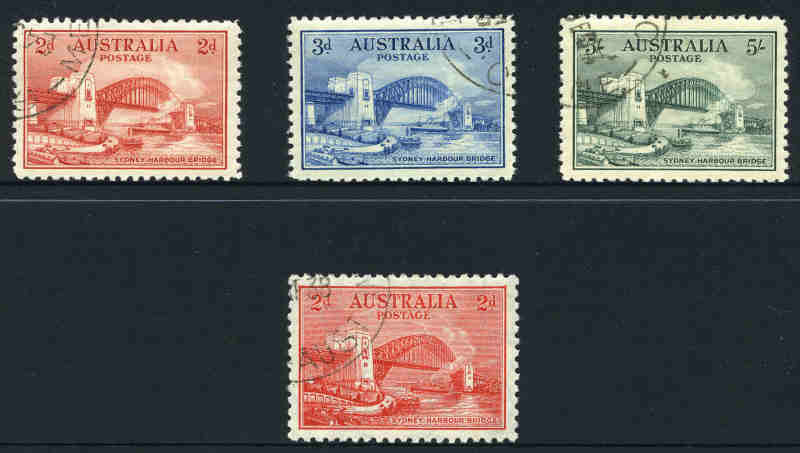 1932 Sydney Harbour Bridge set CTO with gum and well centered. 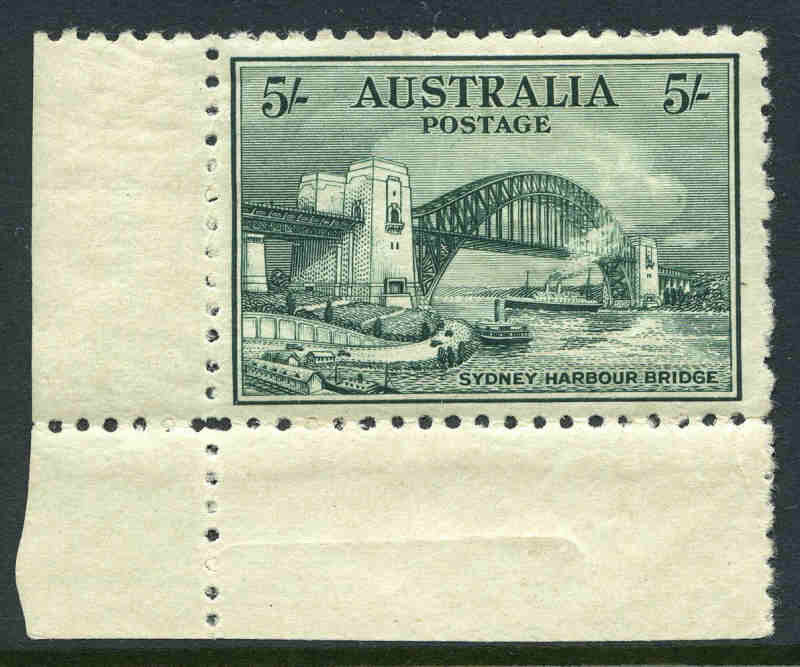 1932 5/- Sydney Harbour Bridge CTO without gum and well centered. 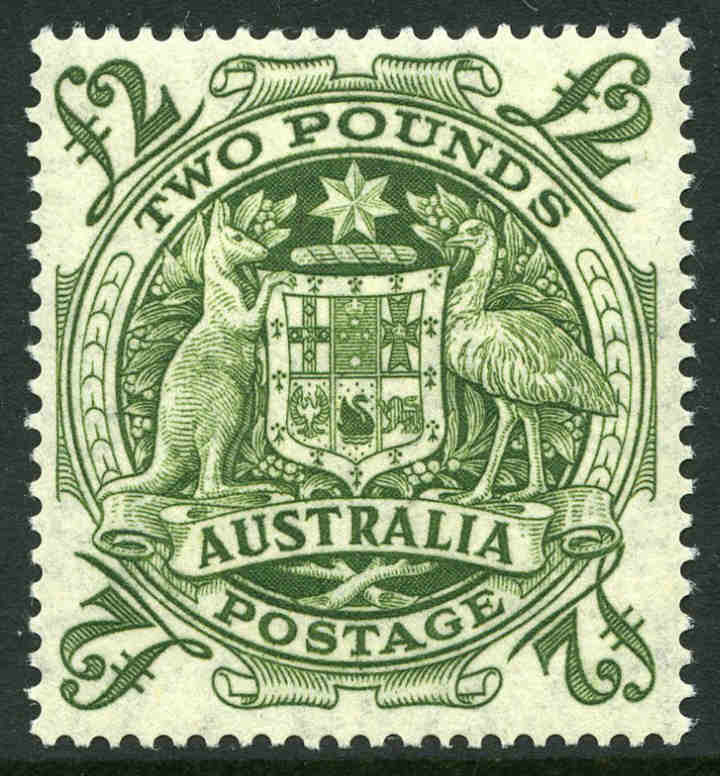 1932 5/- Green Sydney Harbour Bridge fine used and reasonably well centered. An attractive commercially used example. 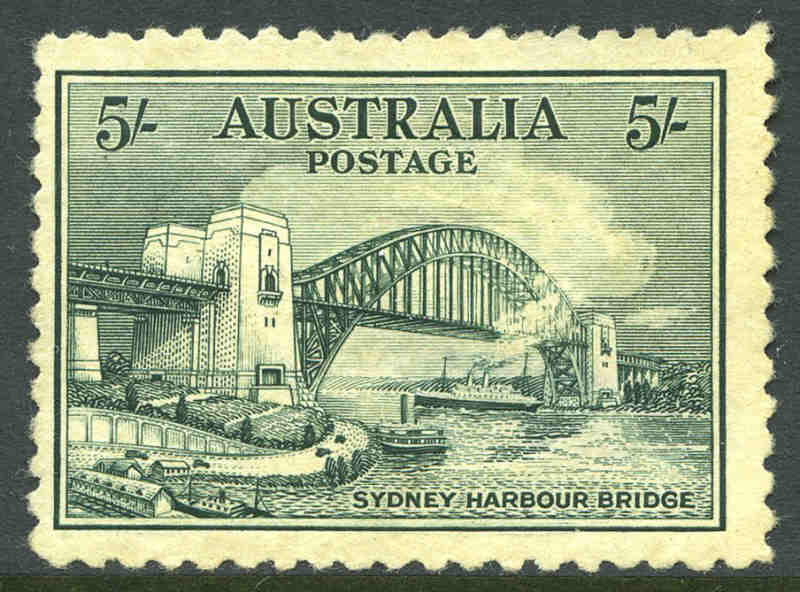 1932 Sydney Harbour Bridge set MLH. 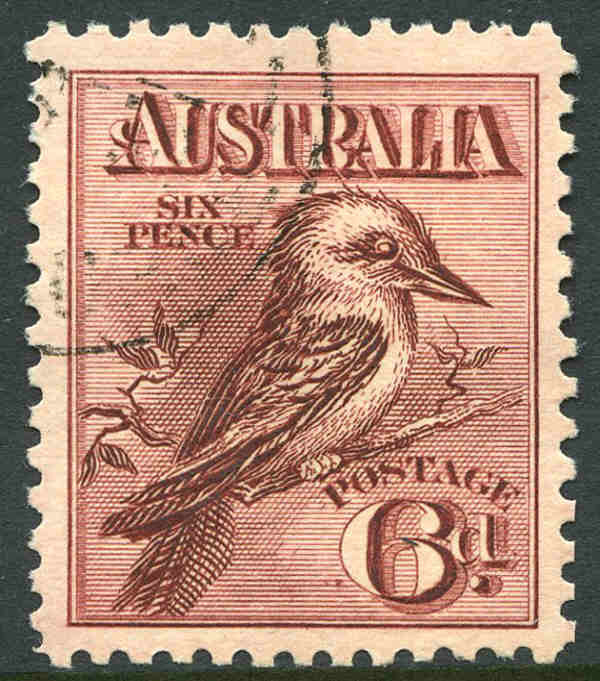 5/- value is well centered with bluntish lower right corner perf. 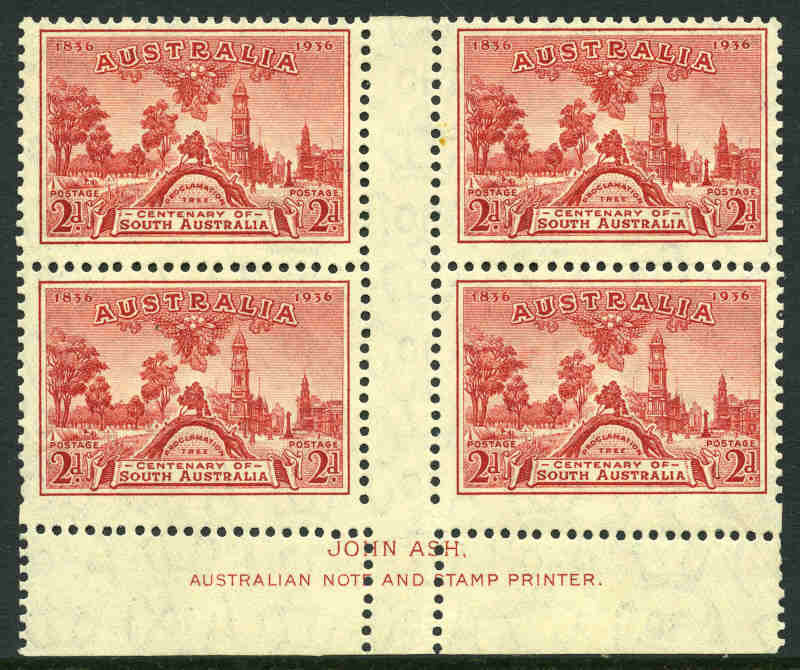 1932 2d Carmine-Red Recess print Sydney Harbour Bridge right side Plate dot marginal block of 6 MUH and well centered. 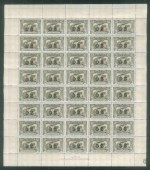 The dot is 17.5mm from the frame of the stamp and a possible trace of a Plate dot on the edge of the selvedge, would indicate this block is likely to be from Plate 4. 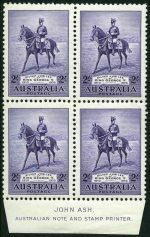 Top left unit with few short perfs. 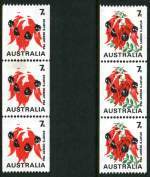 ACSC 146za. 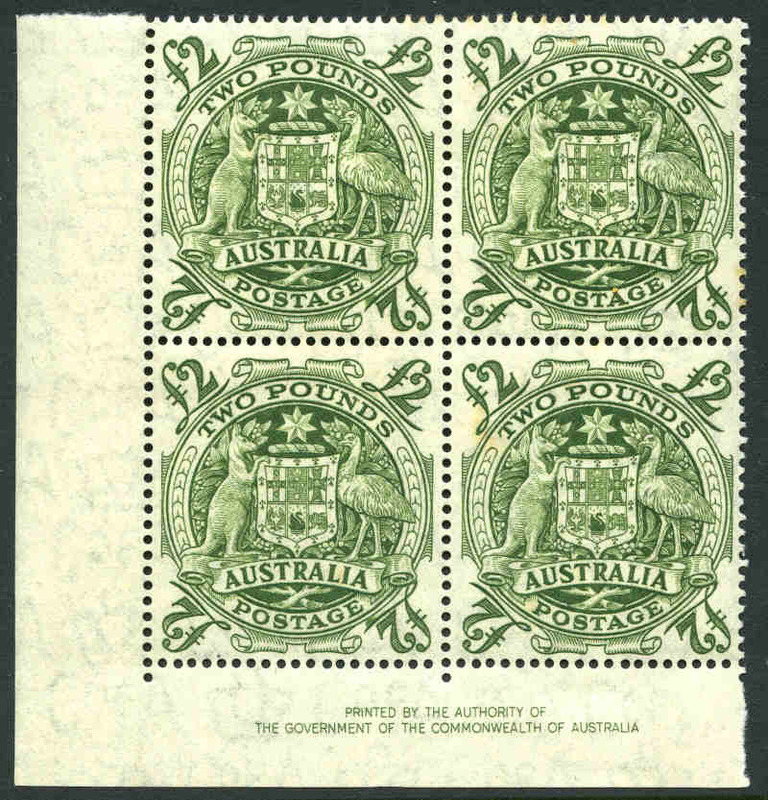 1934 1/- Perf 11½ Vic Centenary MUH imprint block of 4 centered slightly high. 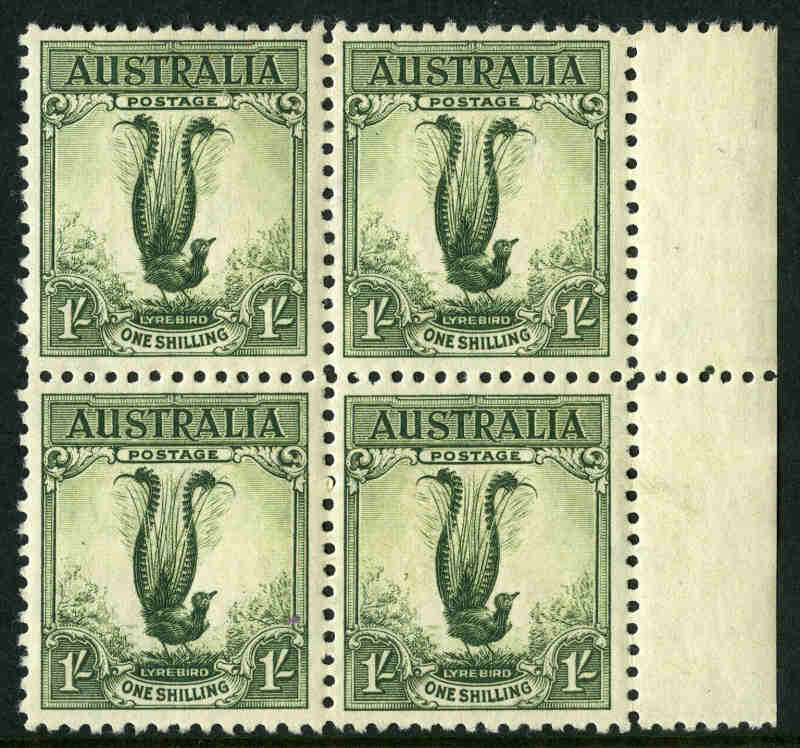 1934 1/- Perf 11½ Vic Centenary reasonably centered imprint block of 4 lightly hinged on top units and lower units MUH. 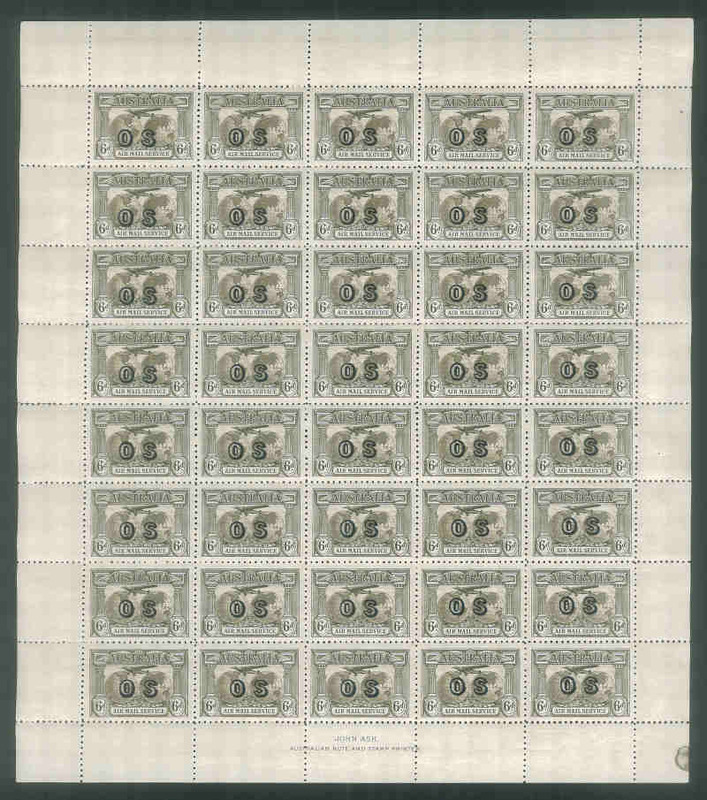 1934 9d Macarthur imprint block of 4 MUH and centered to right. 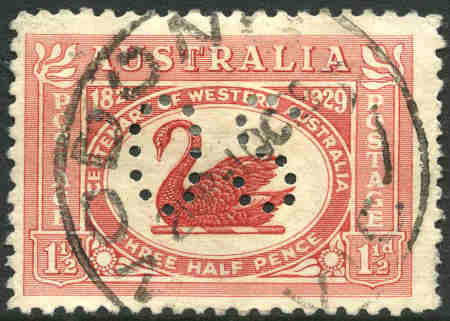 1934 1/6 No Wmk Hermes MUH and well centered. 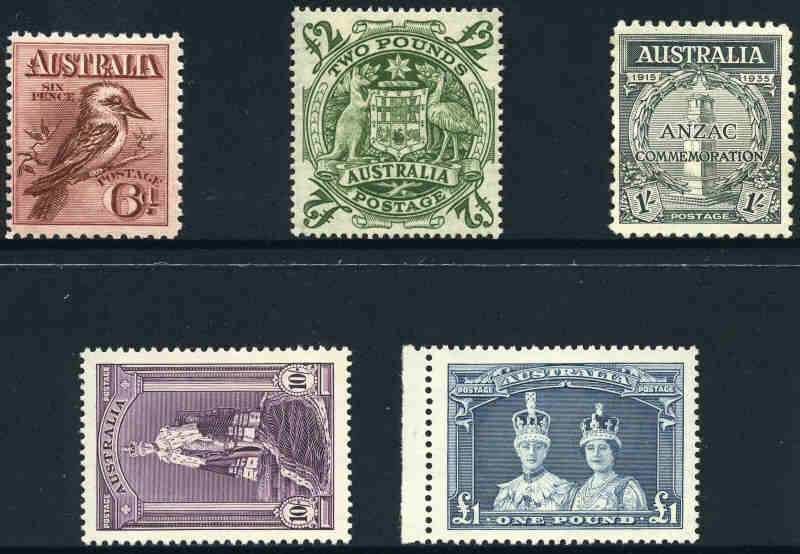 1935 Anzac set and 1935 Silver Jubilee set MUH and reasonably centered. 1935 2/- Silver Jubilee imprint block of 4 MUH and well centered. 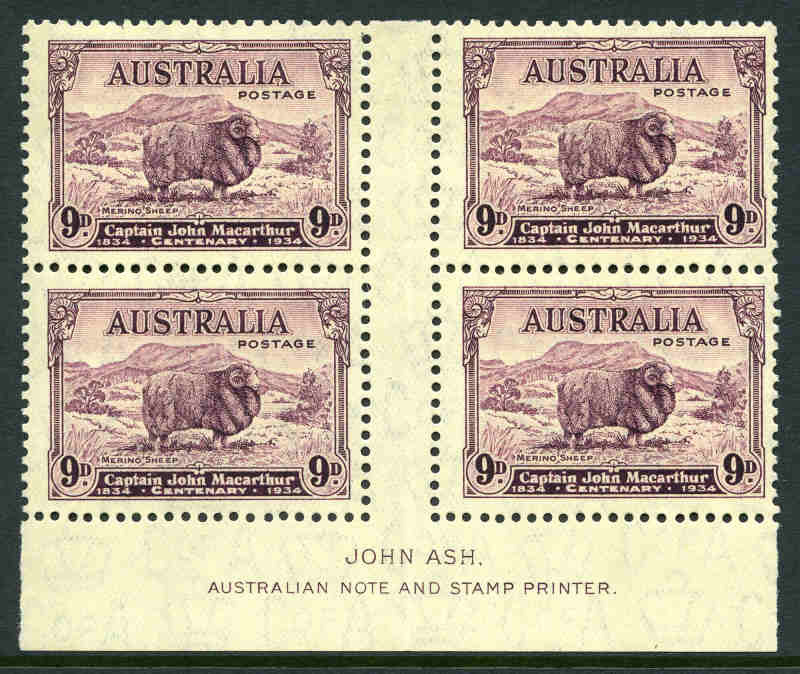 1936 2d SA Centenary imprint block of 4 with Retouched sky below "AU" variety, lightly hinged on top units and lower units MUH. 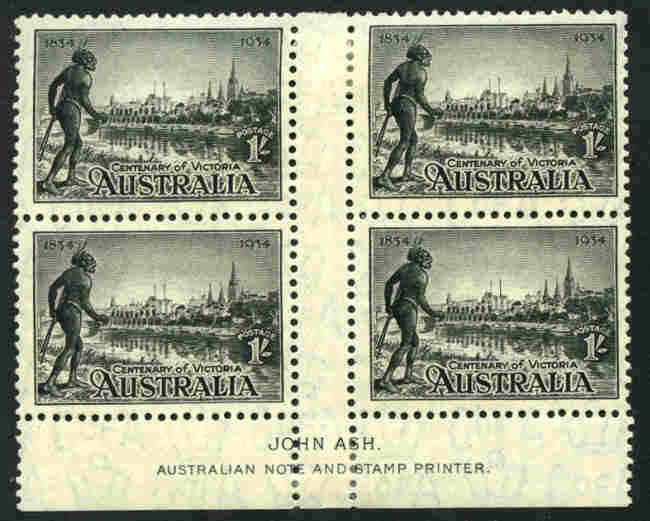 Spectacular perf skip between stamps and imprint. ACSC 171zb. 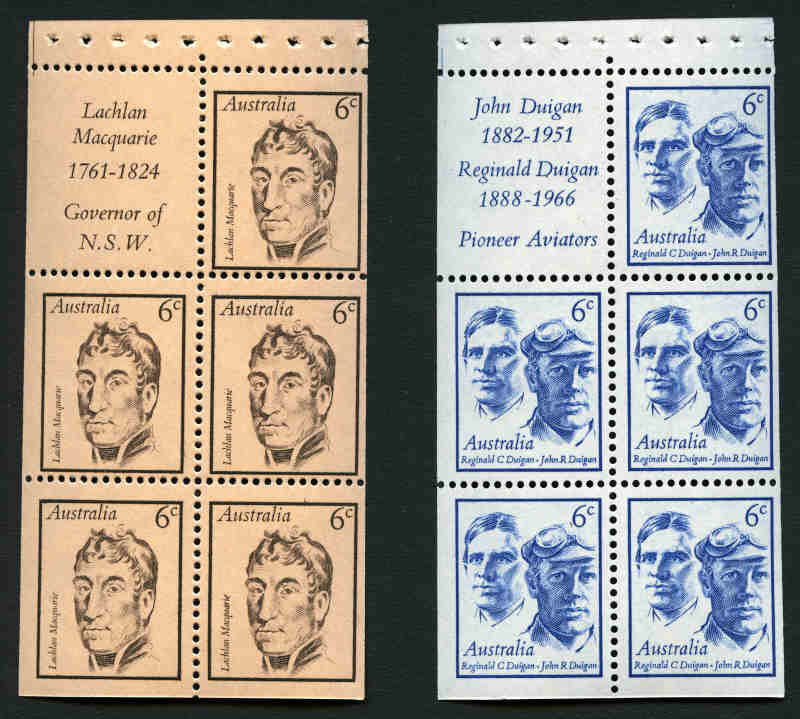 1936 SA Centenary set and 1937 NSW Sesqui set in imprint blocks of 4 lightly hinged on top units and lower units MUH. 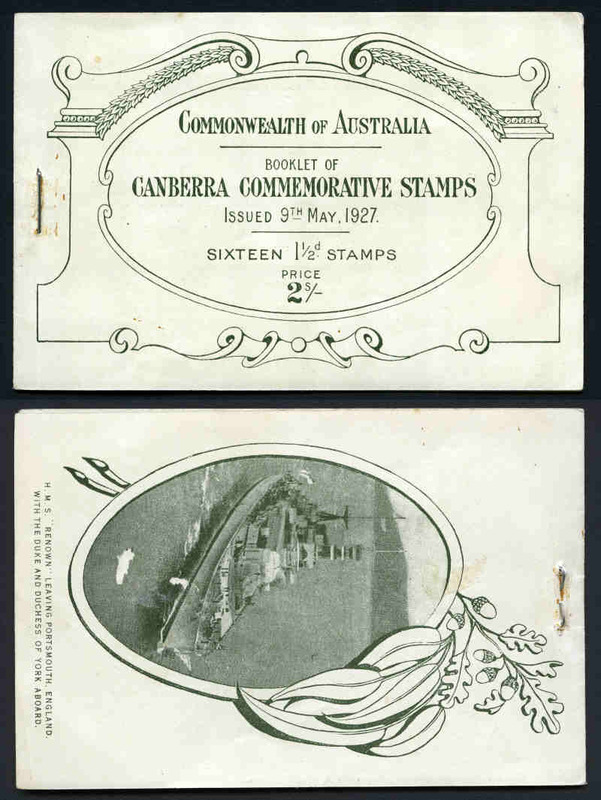 1/- SA Centenary centered to base. 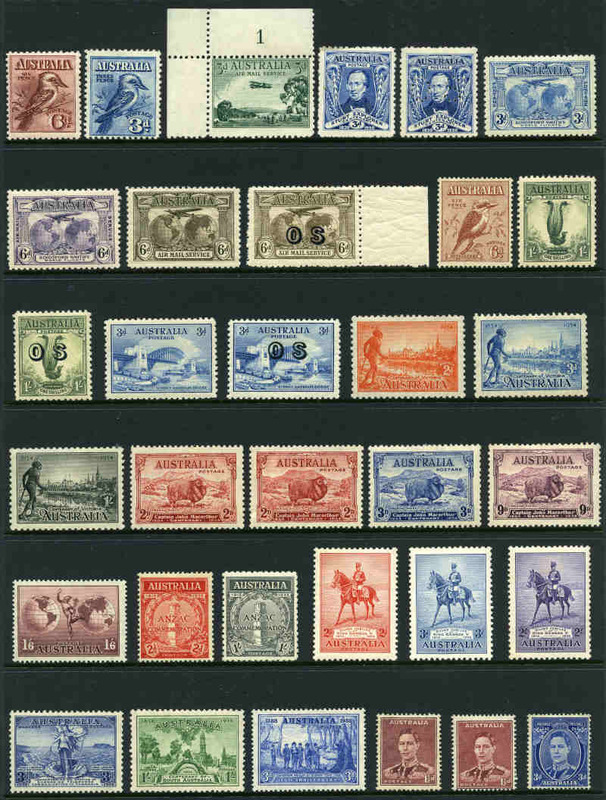 Complete MUH Pre-Decimal and Decimal simplified collection from 1937 NSW Sesqui set to 1980 Aircraft set in Sherwood Albums including 1937 NSW Sesqui set, 1937 3d Blue Die I KGVI, 1938 Thick Paper Robe set, 1940 AIF set, 1949-50 Arms set (£2 lighly creased), 1961 5/- Cream Paper Cattle and 1963-64 Navigator set of 6, plus Australian Antarctic Territory complete MUH collection from 1957 2/- Map to 1980 Ships set in Sherwood Album. Centering varies. 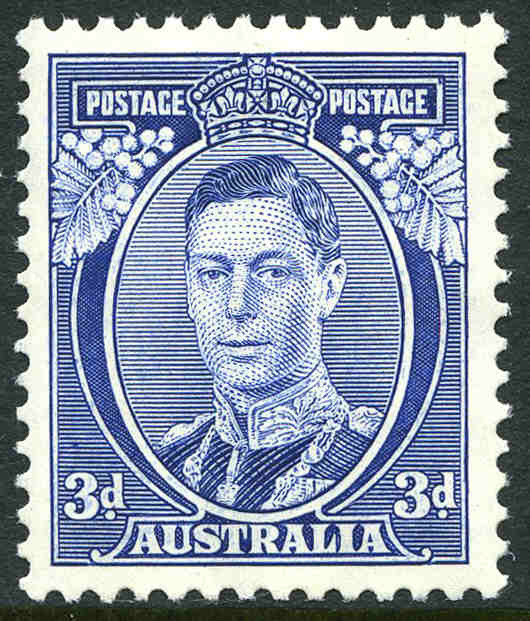 1937 3d Blue Die I White Wattles MUH and reasonably centered. 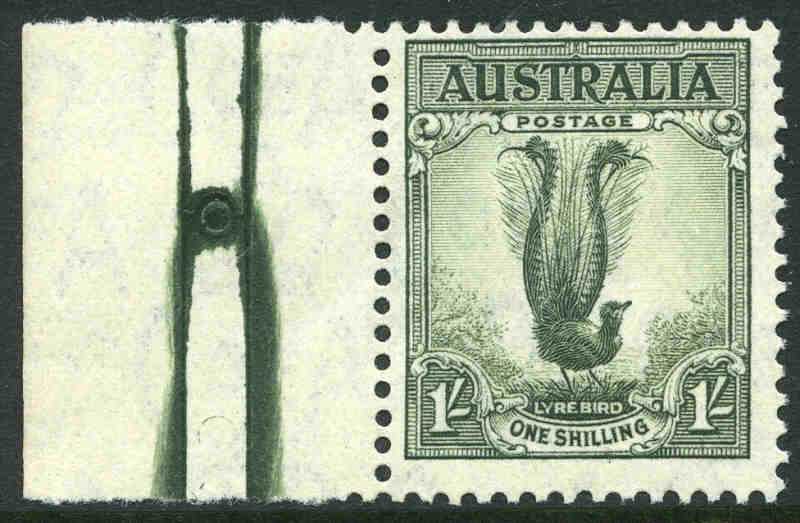 1937 1/- Perf 13½ Lyrebird MUH marginal copy centered high with perforation guide mark from Sheet B left side. 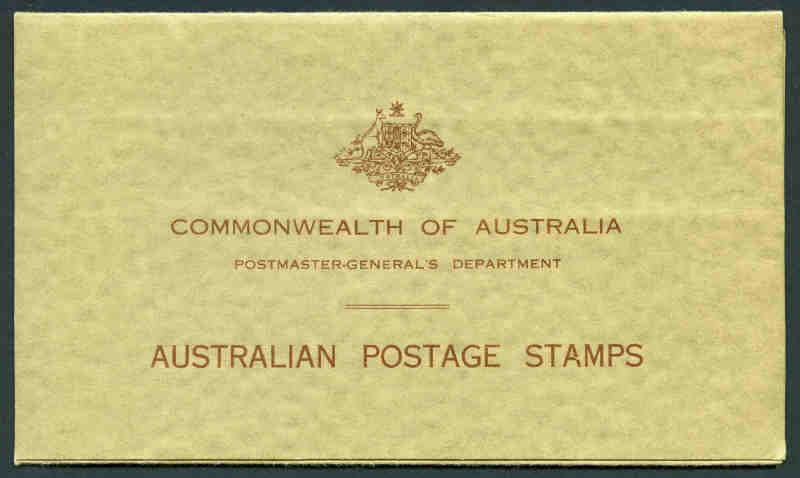 1938 £1 Thick Paper Robes O/P SPECIMEN, unusually and inadvertently CTO with GPO cancellation, very lightly hinged with full gum and well centered. 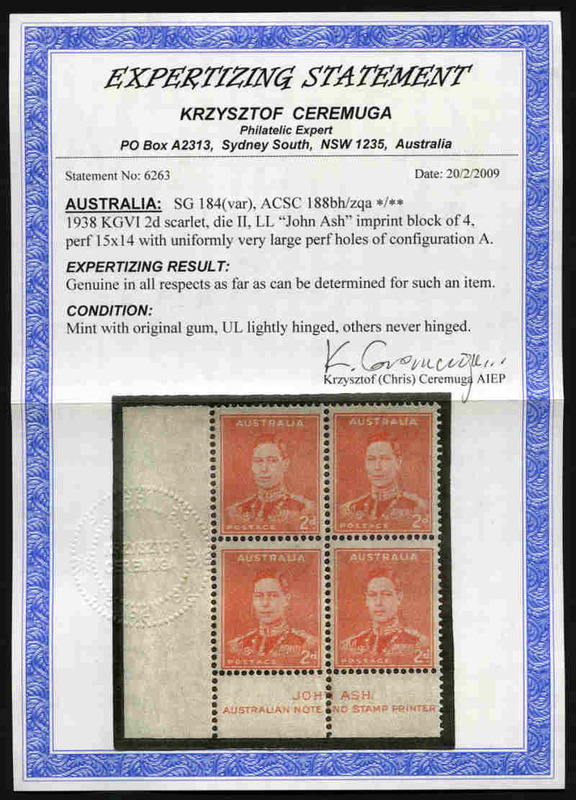 [The ACSC notes examples of the Arms SPECIMEN Overprints with CTO cancels, but makes no such mention of them on the Robes issue]. 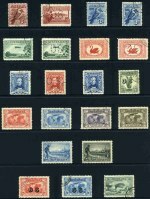 Similar example sold for $1,150.00, plus buyers premium in Prestige Philately's Rarities auction of 10/4/2010. 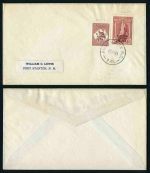 1949 £1 Thin Paper Robes MUH and well centered. 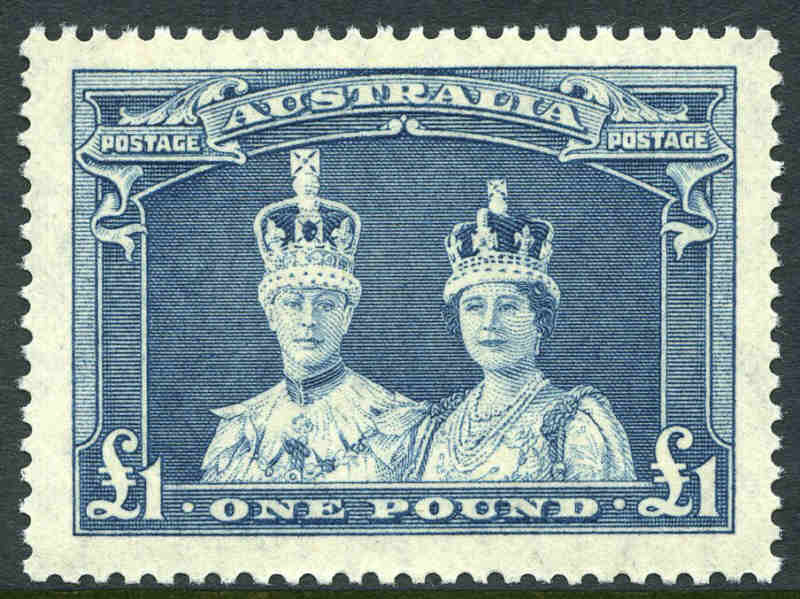 1949 £1 Thin Paper Robes and 1950 £2 Arms MLH and reasonably centered. 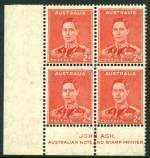 1942 2½d Scarlet KGVI booklet MUH. ACSC B53A. Retail $150.00. 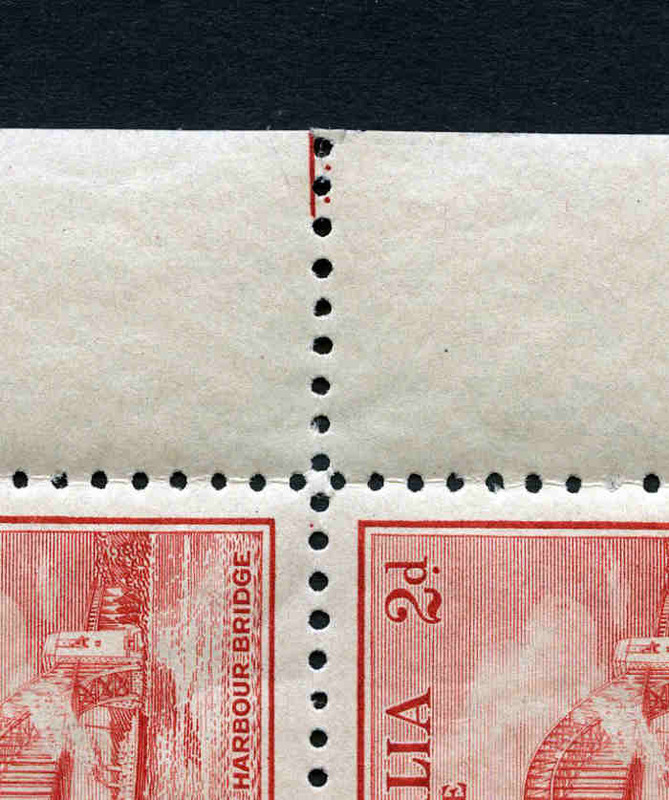 1945 2½d Gloucester FU imprint pair with pre-perforating paper fold showing extra perforations in selvedge. 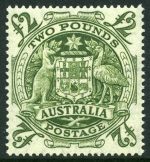 1949-50 £1 (2) and £2 Arms FU and £1 and £2 Arms O/P Specimen MLH. 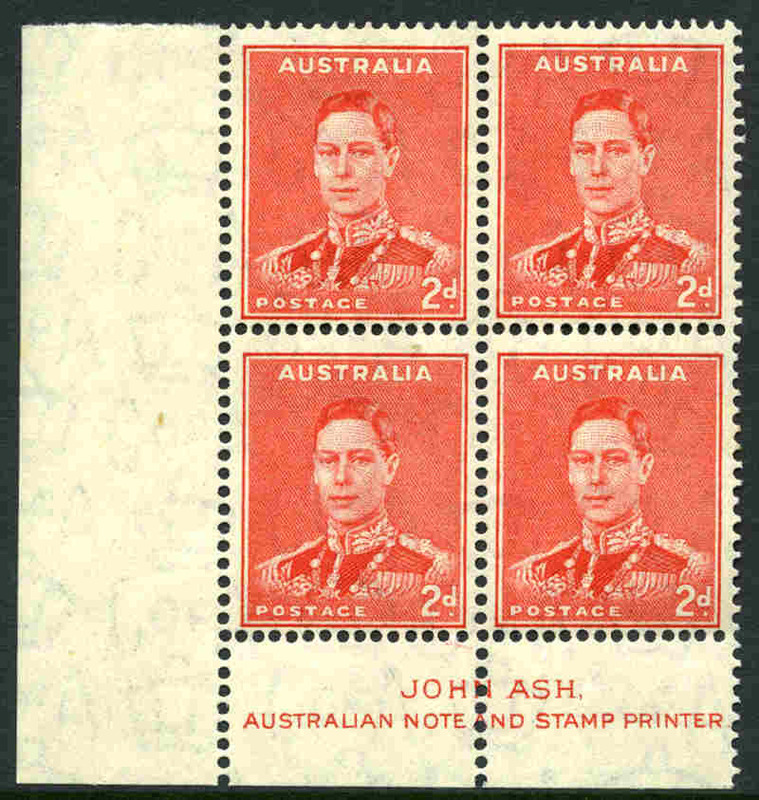 1950 £2 Arms imprint corner block of 4 with roller flaw below "E" of "Postage" variety, lightly hinged on top left unit and remaining units MUH. Well centered with faint tone spots. ACSC 271zb. 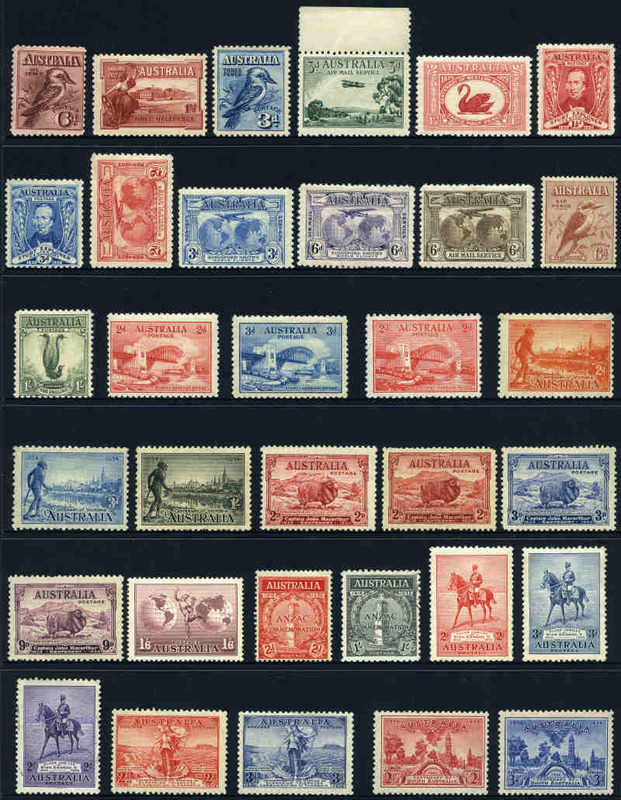 1949-50 Arms set O/P Specimen MUH and reasonably well centered. 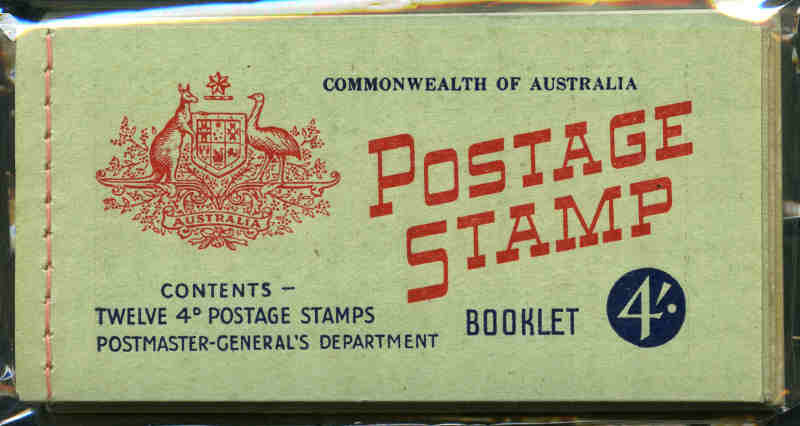 Post Office presentation folder containing 1949-50 Arms Specimen set MUH and range of CTO with gum issues. 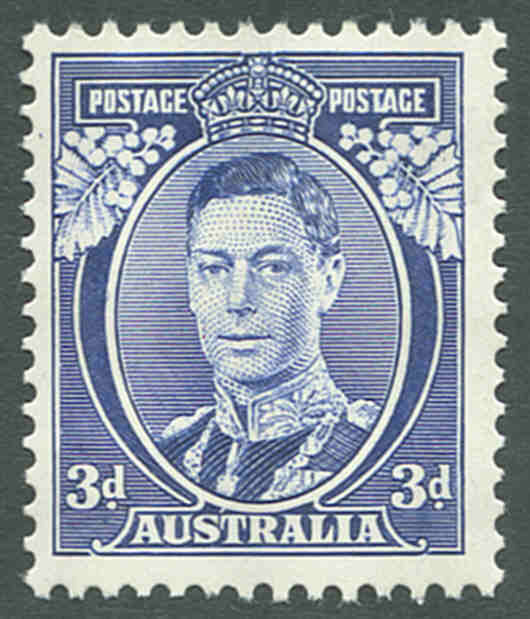 1952 3½d Purple-Brown KGVI original and revised text, 1953 3½d Carmine Red Wmk QEII (5), 1957 4d Lake QEII (2), 1960-62 5d Blue QEII "Coat of Arms" (2) and "New Cover Design" (2) and 1965 5d Red QEII booklets MUH. Covers with minor faults. ACSC B56A, B56C, B57, B63B, B65I, B66V, B66W and B69D. Retail for booklet panes $480.00. 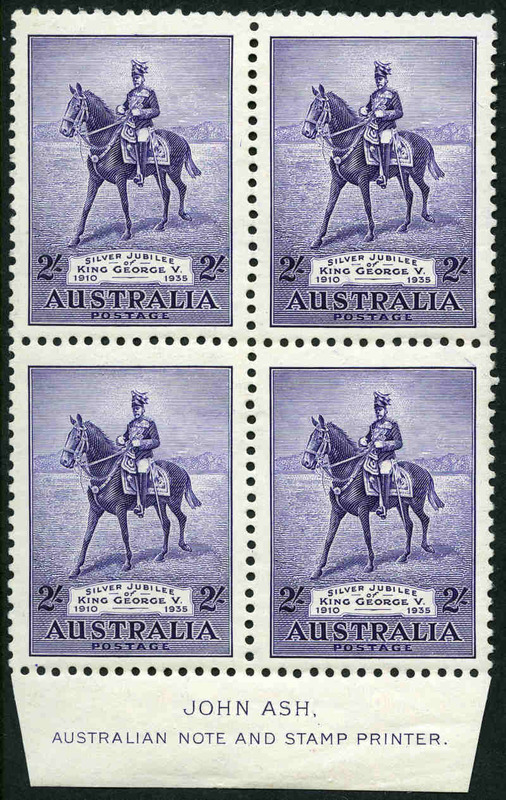 1952 3½d Purple-Brown KGVI original and revised text (3 of each), 1953-56 3½d Carmine Red Wmk (3, one with wax interleaving) and No Wmk (5) QEII, 1957 4d Lake QEII (3), 1960 5d Blue QEII "Coat of Arms" front cover and 1964 5d Green QEII booklets MUH. Covers with minor faults. ACSC B56A, B56B, B56C, B57, B57v, B58, B61, B65Ld and B67P. Retail for booklet panes $590.00. 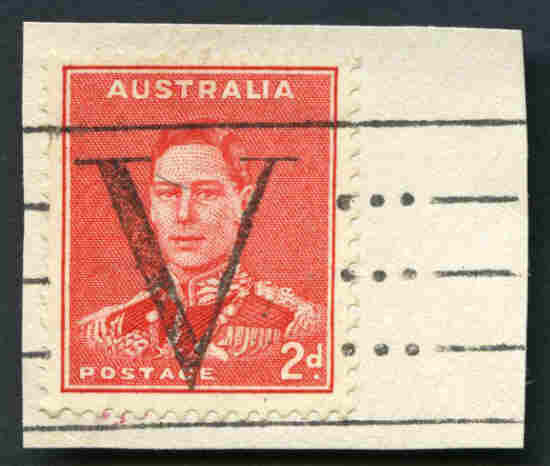 1952 3½d Purple-Brown KGVI original and revised text and 1956 3½d Carmine Red No Wmk QEII booklets MUH. (5 of each). ACSC B56A, B56B and B58. Retail $525.00. 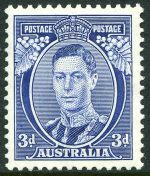 1952 3½d Purple-Brown KGVI original text (1) and revised text (6), 1956 3½d Carmine Red No Wmk QEII (3), 1957 4d Claret QEII "British Empire" and "British Commonwealth" (2 of each) and 1959 4d Lake QEII (3) booklets MUH. ACSC B56A, B56B, B56C, B58, B60A, B60B and B61. Retail $735.00. 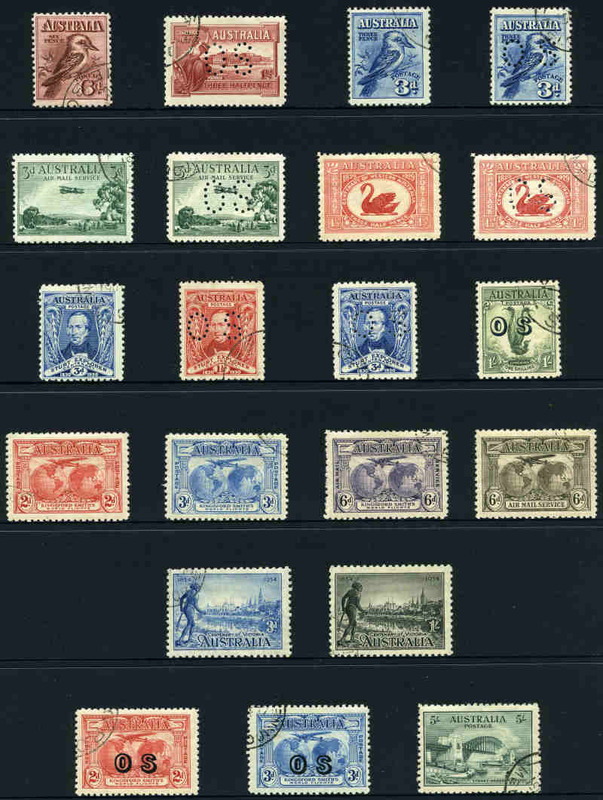 Complete MUH Pre-Decimal simplified collection from 1953 Coronation set to 1965 5d Christmas in Sherwood Albums including 1961 5/- Cream Paper Cattle and 1963-64 Navigator set of 6. Generally well centered condition. 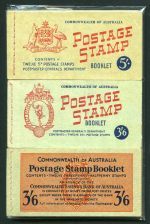 1953 3½d Carmine-Red Wmk and No Wmk QEII booklets MUH. (10 of each). Retail $430.00. 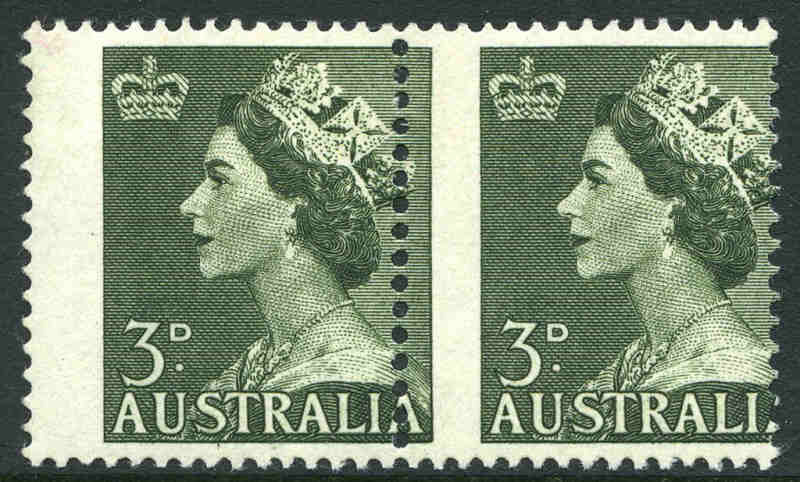 1953 3d Green QEII horizontal pair MLH with vertical perforations misplaced 3mm to left. Uncatalogued in ACSC. 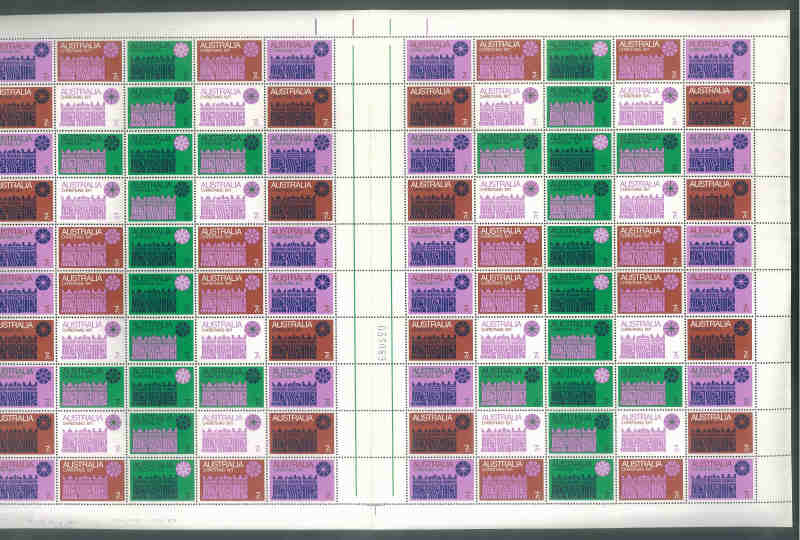 1957 4d Claret "British Empire" QEII, 1957 4d Lake QEII (2) and 1964-65 5d Green and 5d Red QEII booklets MUH. ACSC B60A, B61, B67E and B69H. Retail $330.00. 1962 5d Blue QEII "New Cover Design" Wax Interleaving booklet MUH. 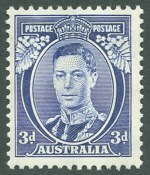 Edition 3/1963, GEN. ACSC B66Qv. Retail $225.00. 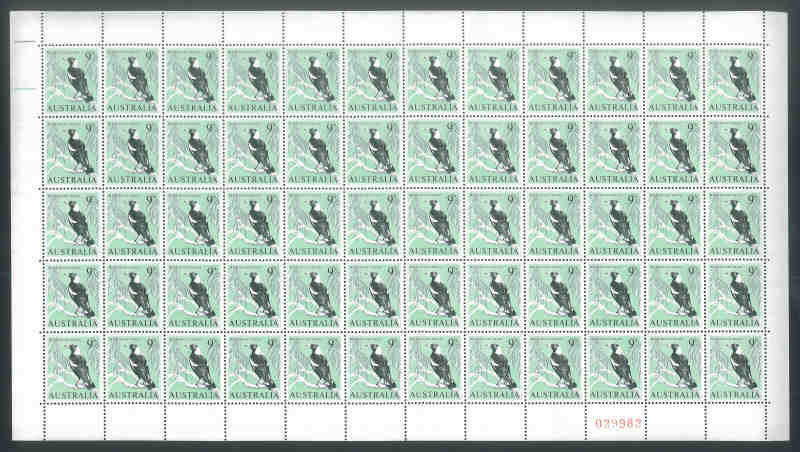 1962 2/3 Perth Games sheet of 80 MUH and well centered. 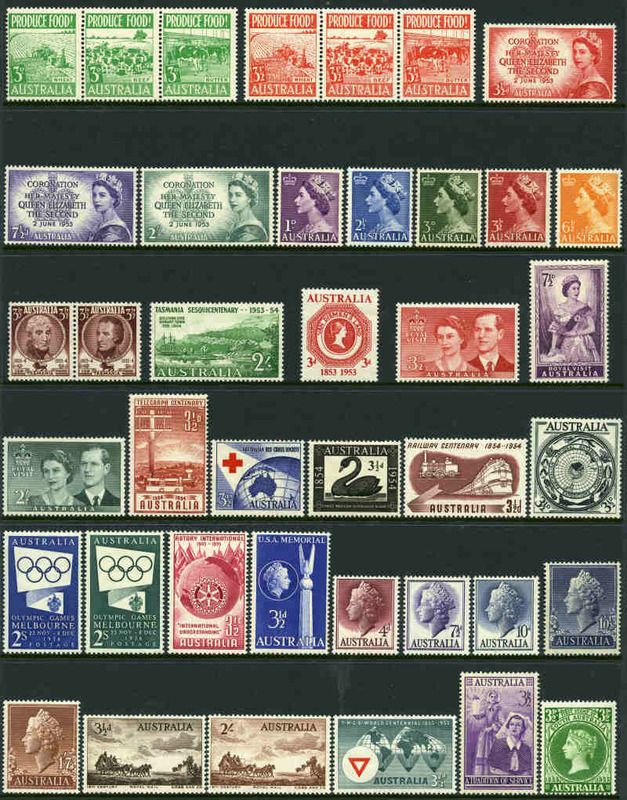 1963 Royal Visit set in MUH well centered sheets of 120. 1964 5d Green QEII Wax Interleaving booklet MUH. Edition G1. ACSC B67Bdv. Retail $275.00. 1963-64 Navigator set of 6 MUH and well centered. 10/- White Paper and £1 Cream Paper. 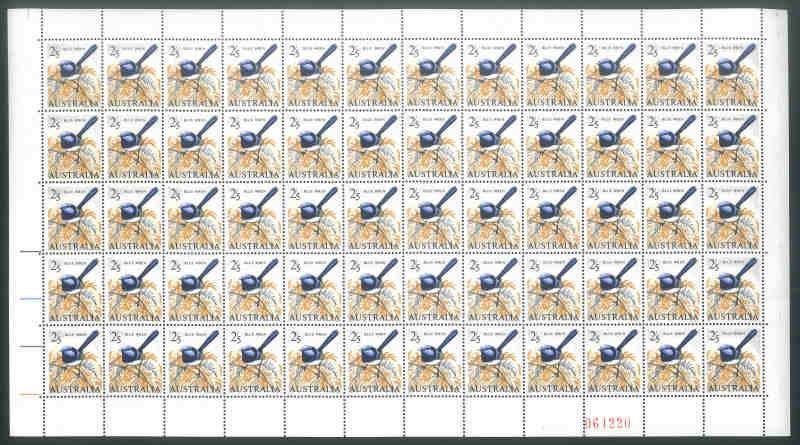 1963 2/3 Cable sheet of 48 with Broken line to "E" of "Cable" and Retouch under "RA" of "Australia" varieties (ACSC 411d and e) and 1965 2/3 ICY sheet of 60 MUH and well centered. 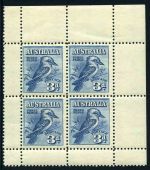 1964-65 Birds set of 8 including both papers of 2/5 value in MUH well centered sheets of 60. Retail $1,200.00. 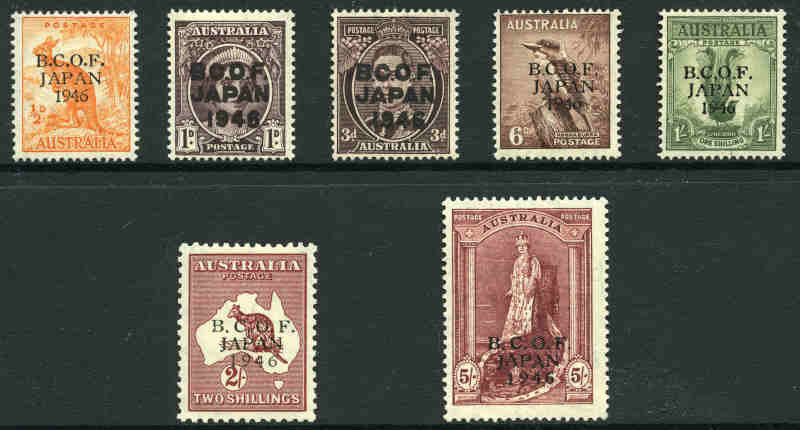 1946 BCOF set MUH. 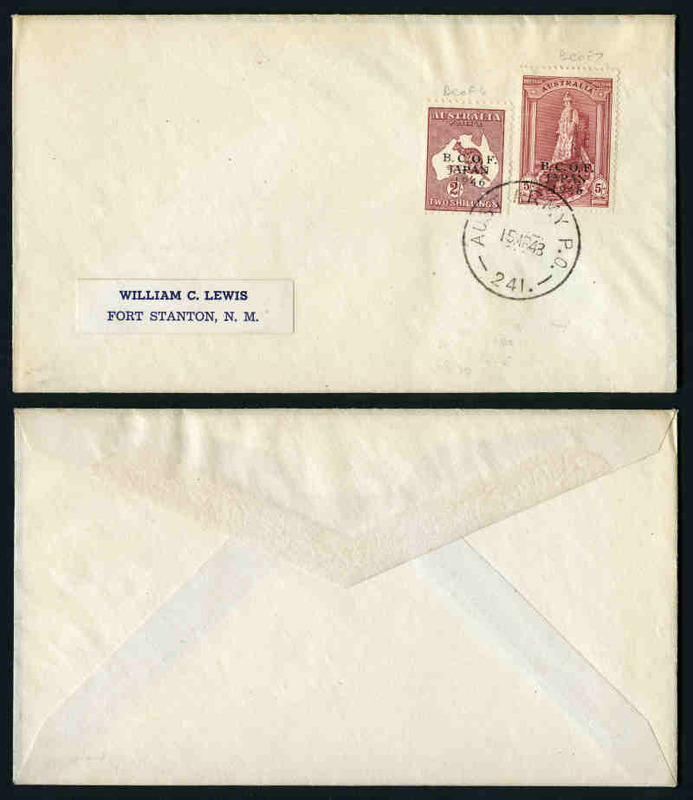 5/- value Thin Paper and centered slightly to upper left. 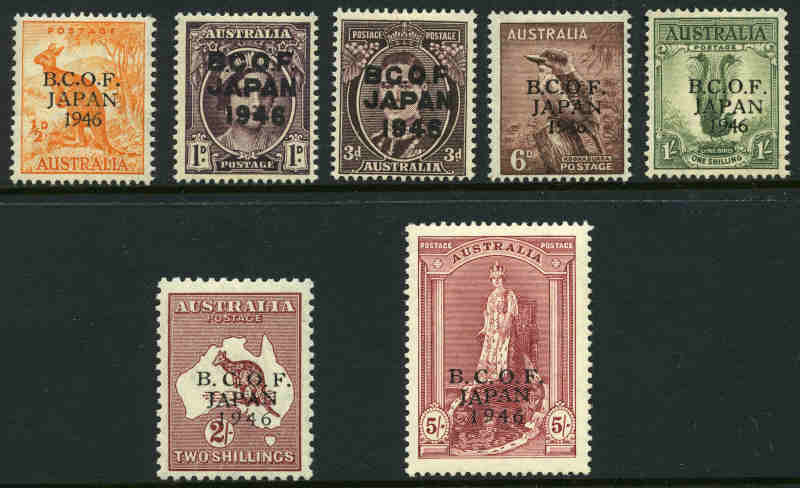 1946 BCOF set MVLH. 5/- Thick Paper and well centered. 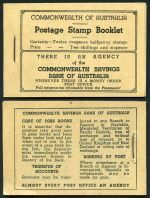 1946 2/- and 5/- Thick Paper BCOF fine used on plain neatly addressed cover cancelled with 1948 Aust Army P.O. 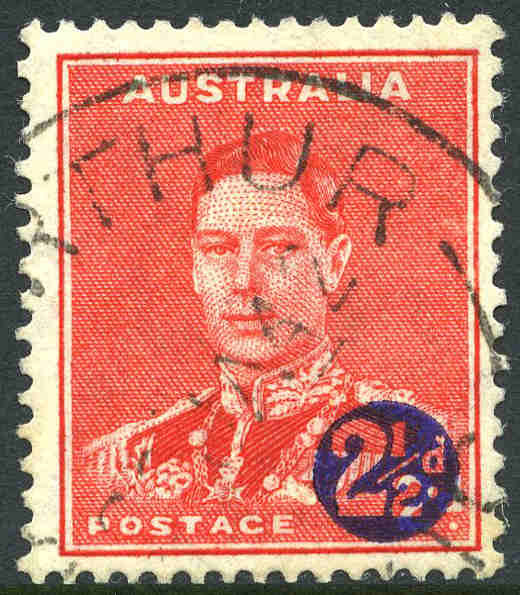 241 CDS postmark. 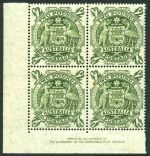 Accumulation of 1,305 used Postage Dues from 1902 to 1960 including watermark, perforation and die variations, plus small range of Victorian and New South Wales issues in Chinese stockbook. 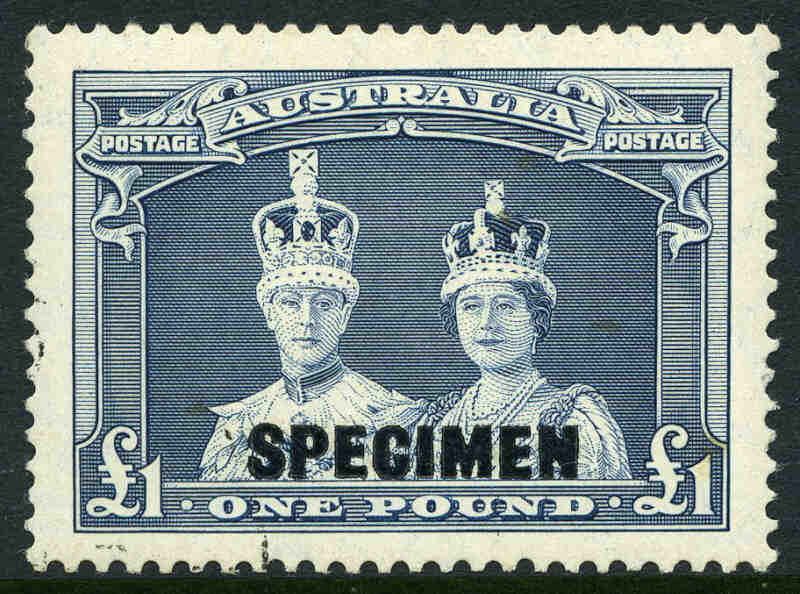 Includes values to 5/- with varying duplication and some multiples. Mainly fine condition with some pen cancels. 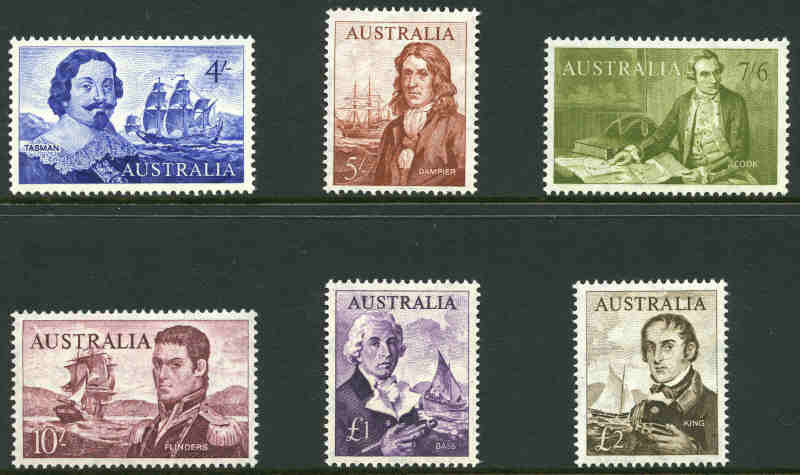 Complete MUH Decimal collection from 1966 QEII set to 1985 Coastal Shipwrecks set including 1971 Christmas block of 25, plus complete Australian Antarctic Territory collection from 1957 2/- Map to 1985 Scenes II set MUH in Seven Seas Hingeless album. 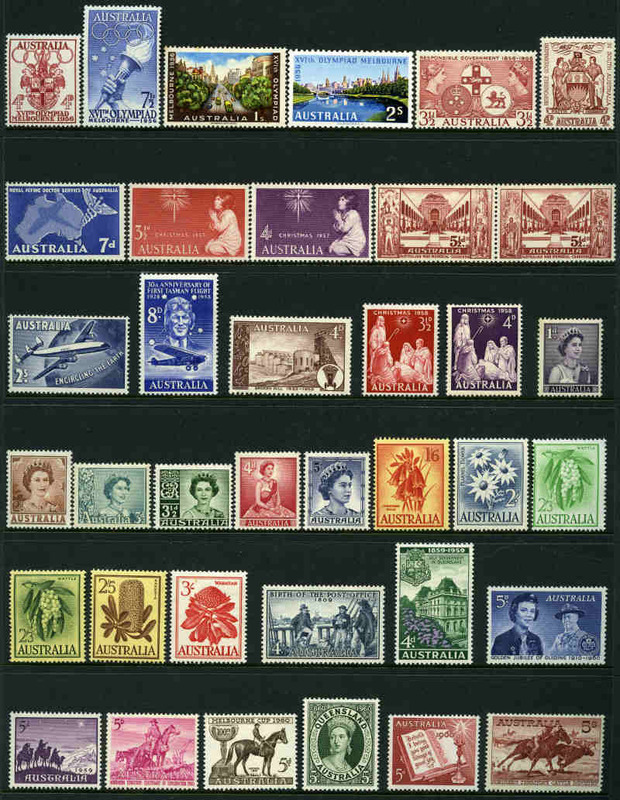 Complete MUH Decimal collection from 1966 QEII set to 1993 Christmas set including 1971 Christmas set of 7, block of 7 and block of 25 (few marks on reverse) with many extra Optional pages, booklets, reprints and Frama sets in 4 Seven Seas Hingeless albums. 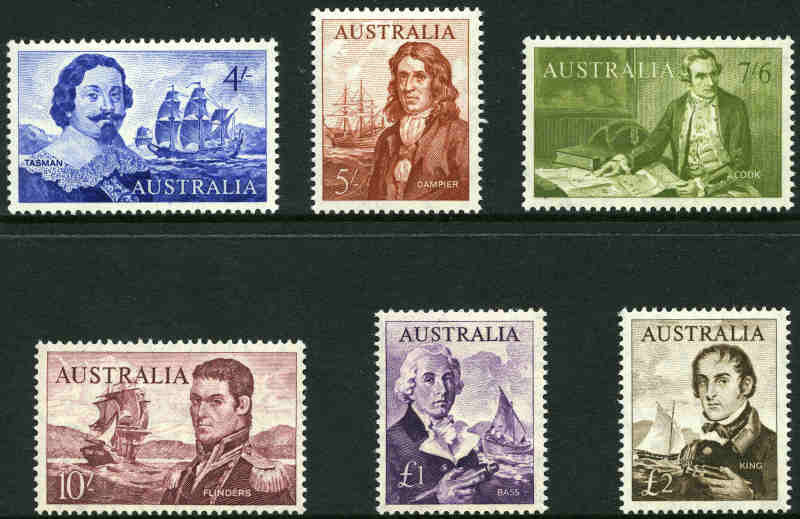 Also complete Australian Antarctic Territory collection from 1957 2/- Map to 1991 Antarctic Treaty set. Face Value $1,085.00+. 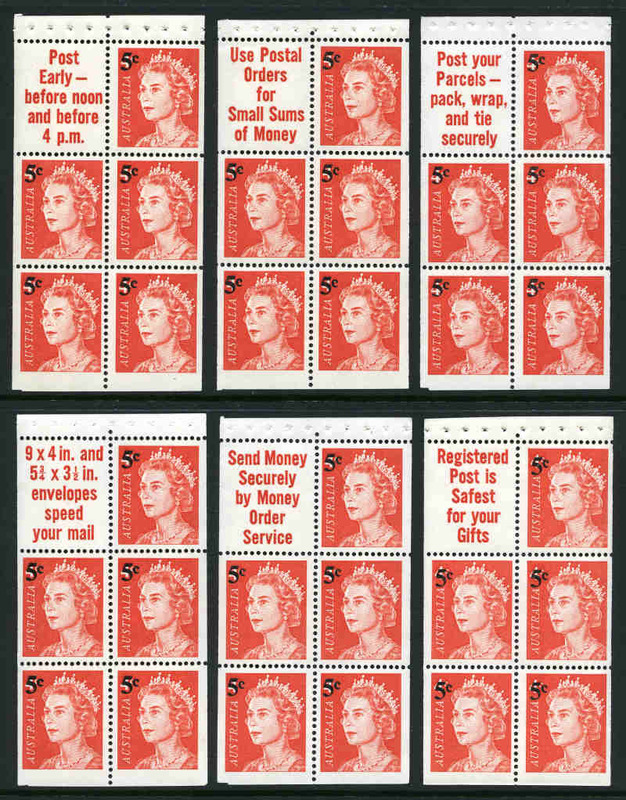 1966 4¢ Red QEII "Send Money Securely" Helecon Ink booklet (2, plus 3 panes), 1967 5¢ on 4¢ Red QEII 50¢ "Post Your Parcels" (2), $1.00 "Post Early", "9 x 4 in" (4) and "Send Money Securely" Provisional Cover and "Post Your Parcels", "9 x 4 in" (2) and "Send Money Securely" Permanent Cover booklets, 1967 5¢ Blue QEII 50¢ and $1.00 (2, plus 3 panes), 1968 Famous Aust (8), 1970 $1.20 Famous Aust and 1972 $1.40 Prime Ministers (2) and set of 2 70¢ (5 sets) booklets MUH. High retail value. 1967 5¢ Blue QEII 50¢ booklet with Letterpress imprint and without imprint on back cover MUH. (5 of each). ACSC B125 and B126. 1967 5¢ Blue QEII $1.00 booklet. (5). Edition G67/3, G67/4, G68/1, G68/2 and V67/3. 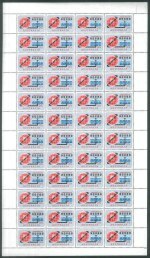 ACSC B127B, C, F, I and K.
1967 5¢ Blue QEII $1.00 "stapled remake" booklet MUH. Minor surface rub on front cover. Edition G68/2. Unrecorded in specialist catalogue. 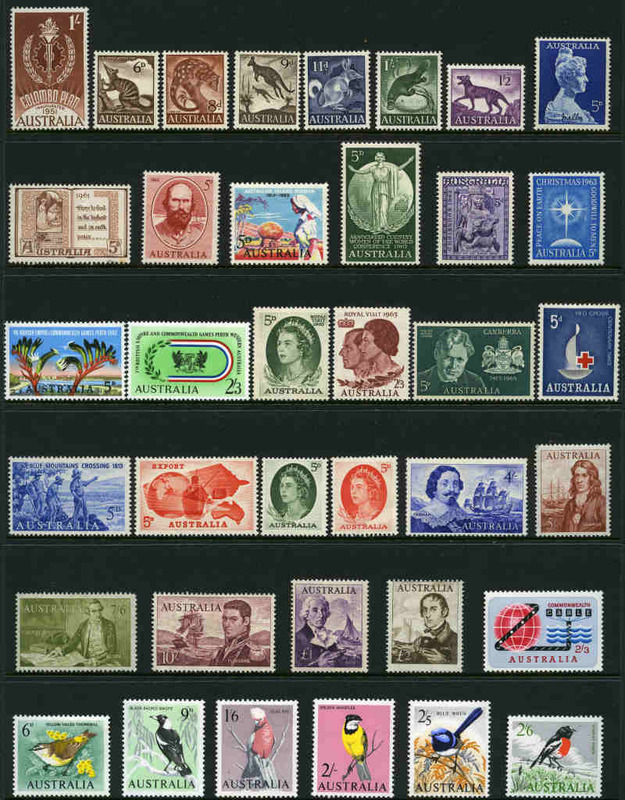 Selection of MUH Decimal issues from 1966 to 1973, mainly in gutter pairs and blocks including 1966 75¢ Navigator upper full Plate No 3 marginal gutter block of 20 with Hooked "C" of "75¢", Extensive recutting at base and Recutting at base State IV varieties, 1966 $1.00 Navigator Lower Plate No 3 (4) and Upper Plate No 3 gutter blocks of 4, 1970 30¢ Royal Visit (22, 2 CTO), 1971 7¢ Blue Star on Pink Christmas (7), 1972 35¢ Munich Games (7) and 1972 35¢ Christmas (7) gutter pairs. Mainly unfolded through gutters and well centered. 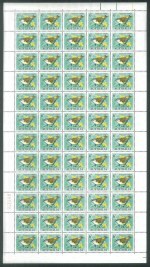 1966 Fish set and 1966 5¢, 6¢, 13¢, 15¢, 20¢, 24¢ and 30¢ Birds in MUH well centered sheets of 50 with wide selvedge. 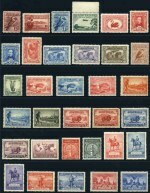 Collection of 58 MUH Decimal issues from 1966 to 1986 comprising of 50 different major listed varieties in singles, pairs and strips. 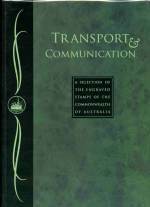 ACSC catalogue value $617.00. 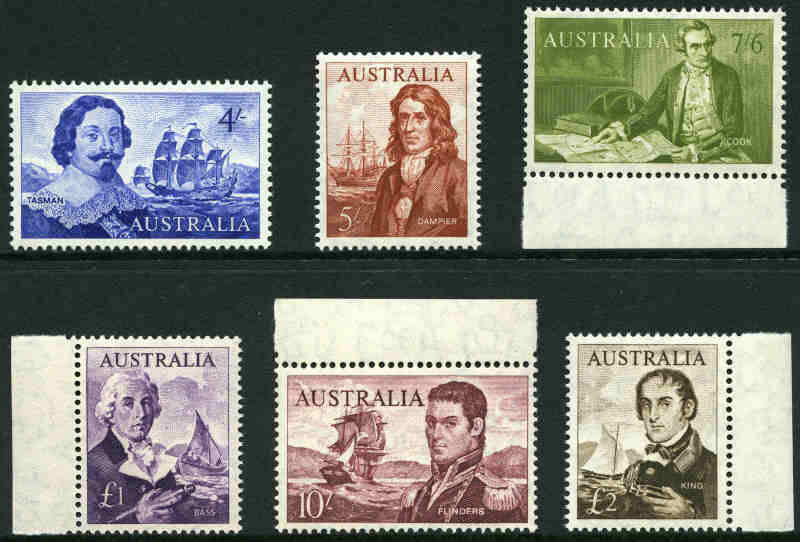 1966-73 $1.00 Navigator selection of 103 stamps FU or CTO with gum, many with varieties including "Extensive recut between sails and eye" and scarce perf 14¾ (3), plus 1969 5¢ Flight strip of 3 (15) and blocks of 9 (6) MUH, several with listed varieties. High catalogue value. 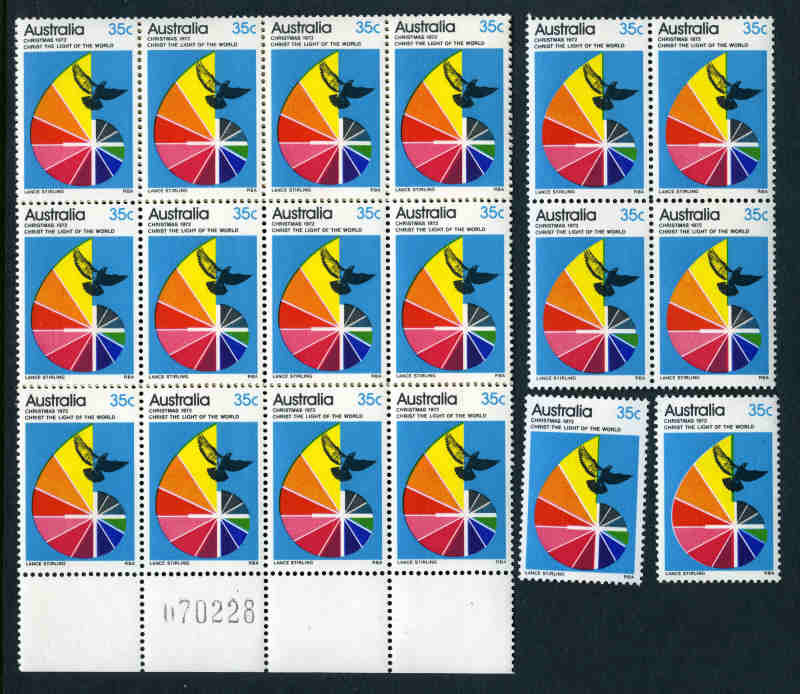 Selection of 345 MUH Decimal stamps from 1966 to 1973 including 1966 Bird set mainly in blocks of 6 (30¢ creased on 3 units), 1966 Navigator set in blocks of 4, 1969 5¢ Flight block of 9, 1970 30¢ Royal Visit (9), 1970 Famous Aust set (5), 1971 Australia Asia set (4), 1971 RSPCA set (5), 1972 Primary Ind (5), 1972 Munich Olympics set (4), 1972 Christmas set (4), 1973 National Dev set (4), 1973 Christmas set (4) and more. Centering varies. 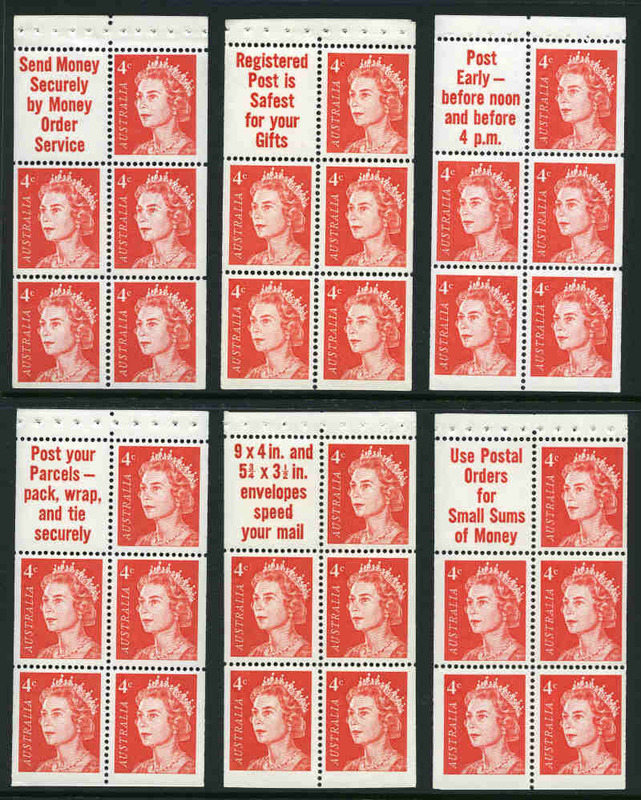 1967 5¢ on 4¢ Red QEII booklet pane set of six slogans MUH. (10 sets). 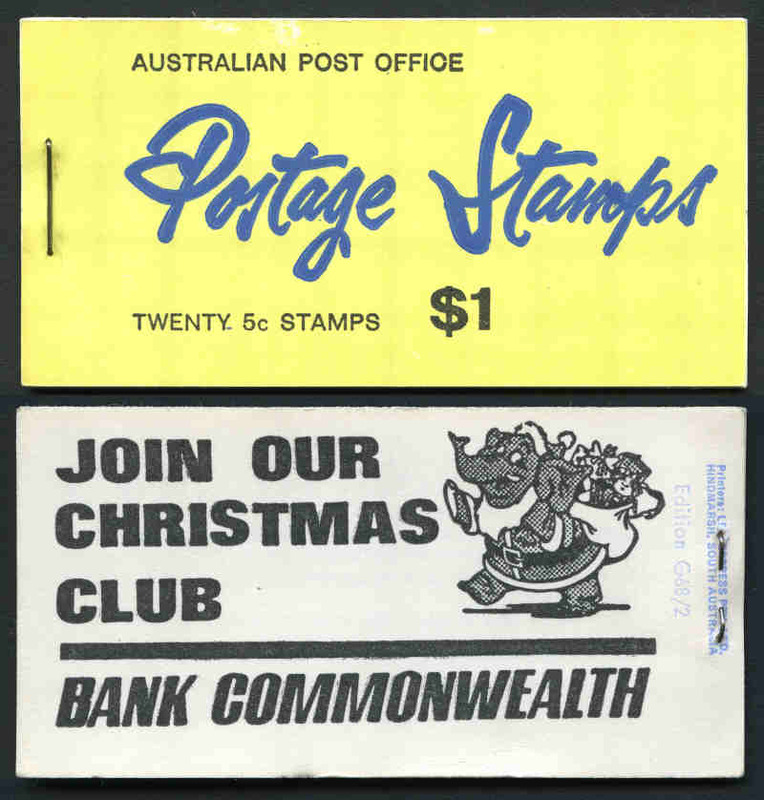 1967 25¢ Christmas, 1968 20¢ Weather Watch, 1968 25¢ Intelsat, 1970 30¢ Royal Visit, 1973 7¢ Famous Aust and 1973 30¢ Christmas in MUH well centered sheets of 100. 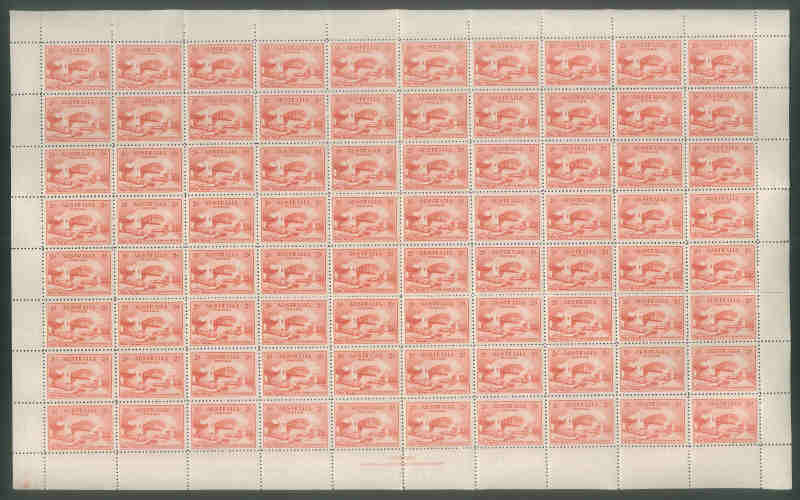 1968 Soil and Medical Thin Lines unfolded gutter block of 10 pairs and 1971 Christmas Cream Paper half sheet of 50 unfolded through blocks of 25 MUH and well centered. 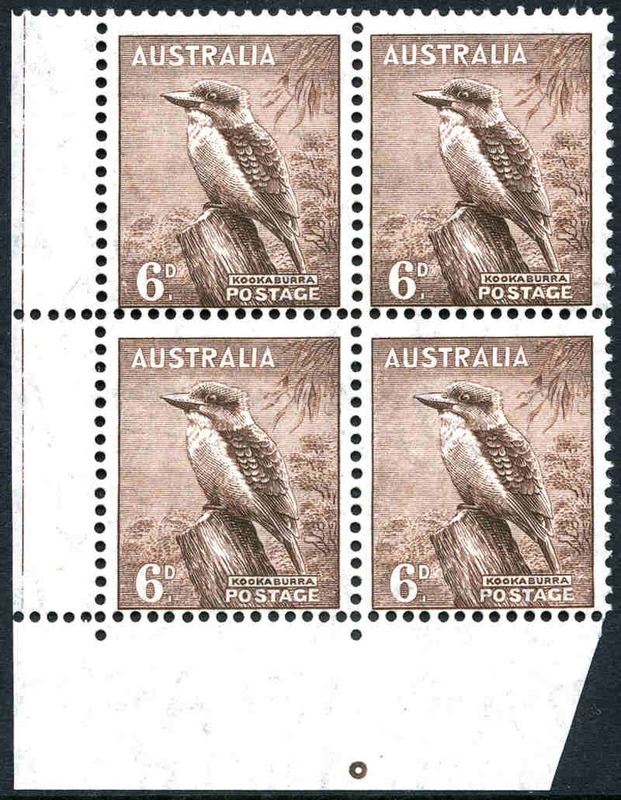 Also 1964 9d Magpie Non Helecon sheet of 60 with faint crease on 5 units MUH. 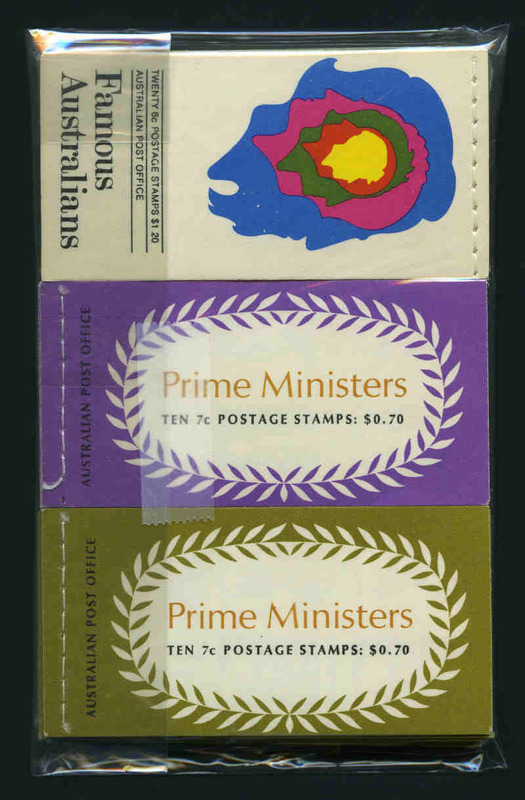 1968 Famous Aust, 1969 Prime Ministers (5), 1970 $1.20 Famous Aust and 1972 Prime Ministers $1.40 (5) and set of 2 70¢ (10 sets) booklets MUH. 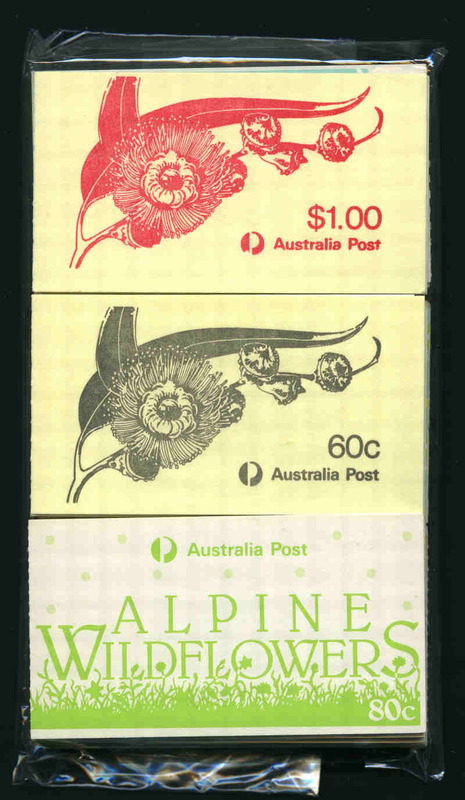 1969 Flight strip of 3 and block of 9 (5 of each), 1970 Cook M/S (4), 1971 Christmas Cream Paper block of 7, 1972 Christmas set (8), 1972 Pioneer Life set (4), 1973-74 Marine Life and Gemstones set (8), 1973 National Dev set (4), 1973 Christmas set (9), 1974 Animals set (4) and 1974 UPU set (20) MUH. 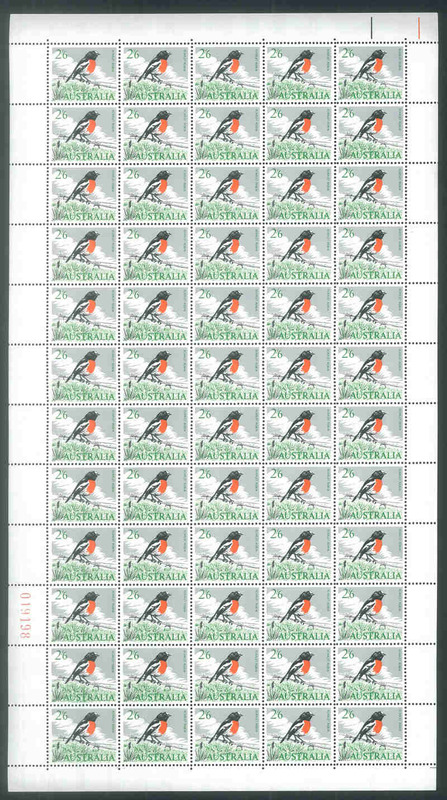 Selection of 124 miniature sheets and 21 unfolded gutter blocks of 10 MUH all with special overprints including 1970 Cook M/S rouletted, 1986 Navigators M/S O/P Stampex (10), 1990 First Postage Stamp M/S O/P Stamp World London (10, plus 4 CTO), 1994 45¢ Koala and Kangaroo M/S O/P Philakorea, 1986 36¢ Year of Peace gutter block of 10 O/P Papal Visit (10), 1997 $10.00 Wetlands M/S O/P Pacific 97 (5) and Italia 98 (3), AAT 1995 Whales and Dolphins M/S O/P Singapore 95 (9) and Capex 96 (16). Very high retail value. Face Value $428.46. 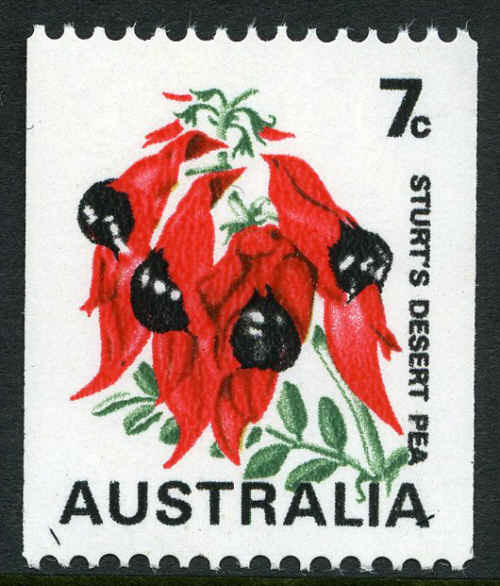 1971 7¢ Sturt's Desert Pea coil strip of 3 with Green and Buff colours omitted MUH. Light transparent mark on centre unit. ACSC 535cg. 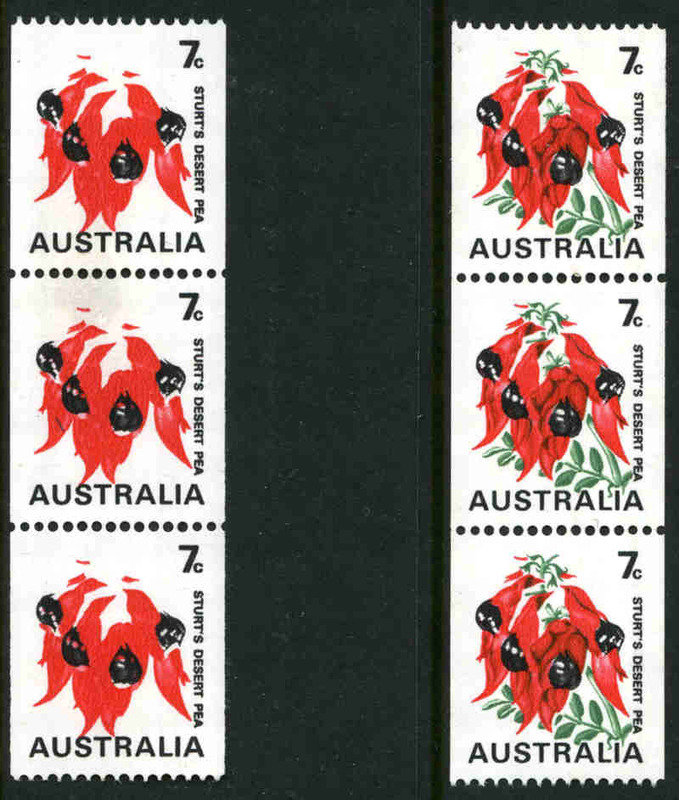 1971 7¢ Sturt's Desert Pea pair, strips of 4 (2) and strips of 8 (5), plus 10 fine used single copies, all with missing Buff and misplaced Green colours. 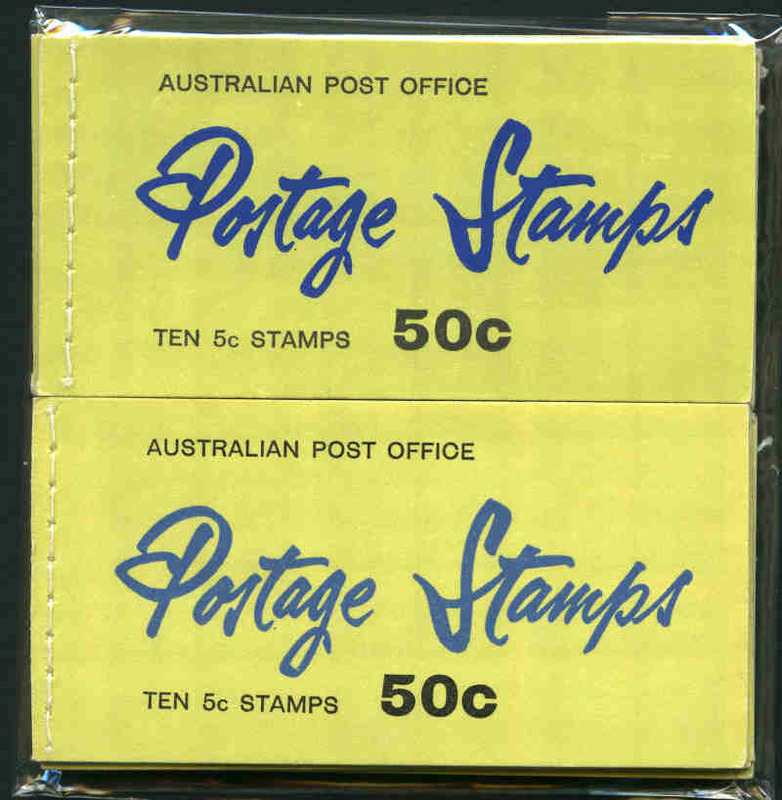 (60 stamps). ACSC 535ce. Catalogue value of MUH copies $15,000.00. 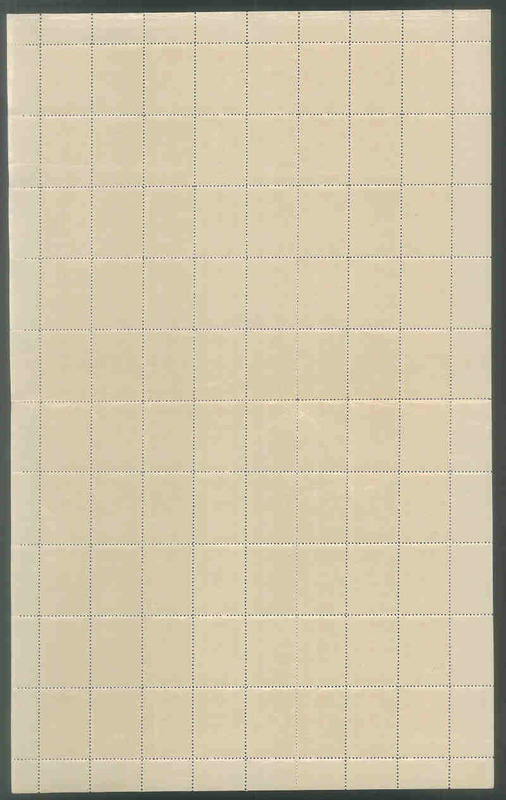 1971 Christmas Cream Paper sheet of 100 lightly folded through panes of 25 MUH and well centered. Lightly creased on one unit and faint tone spots on 2 units. 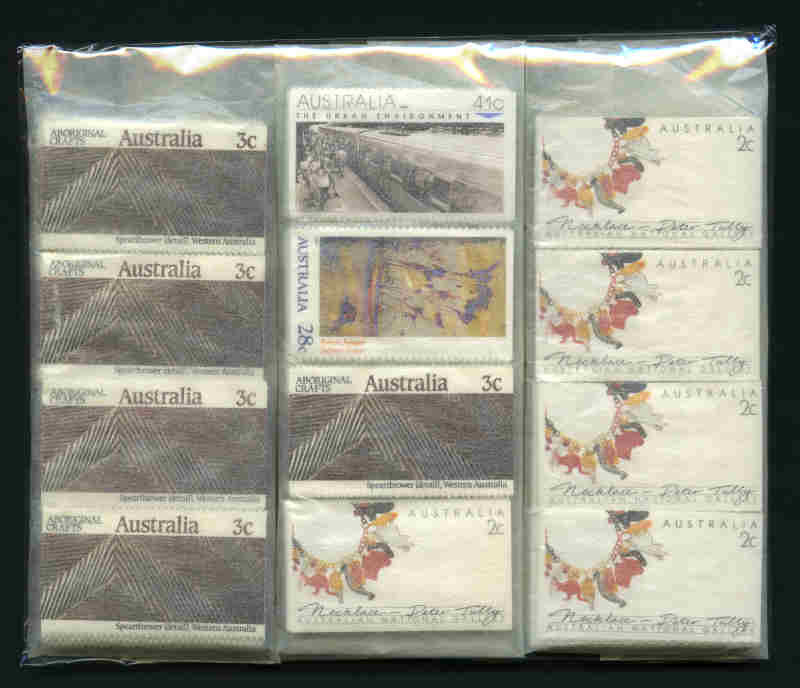 Also 1967 5¢ Blue QEII $1.00 booklet, 1968 Famous Aust booklet (2), 1969 Prime Ministers booklet, plus booklet pane set and 1970 Famous Aust booklet pane set (2) MUH. 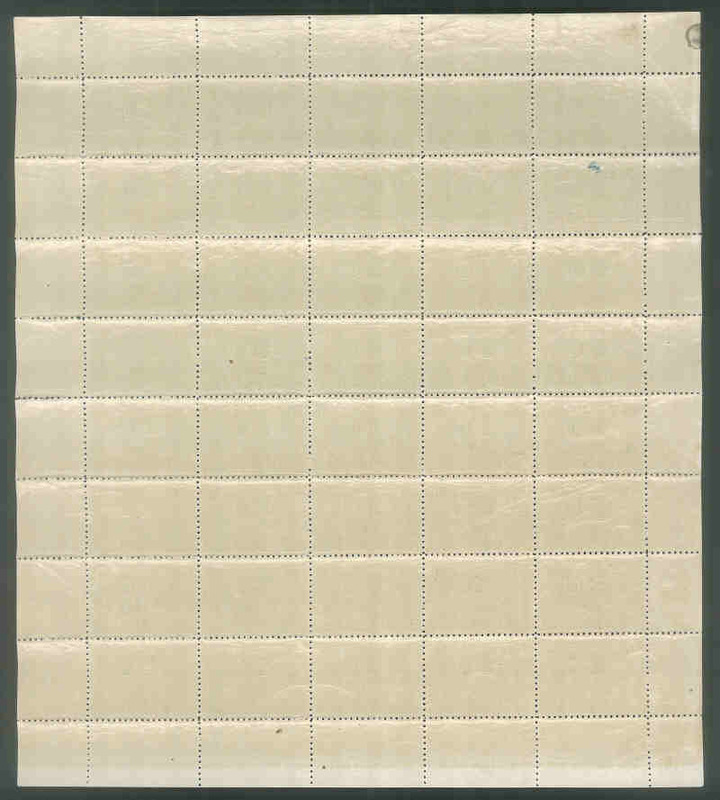 1971 Christmas Cream Paper sheet of 100 unfolded through panes of 25 MUH and well centered. 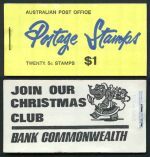 1971 Christmas Cream and White Paper sheets of 100 unfolded through panes of 25 MUH and well centered. 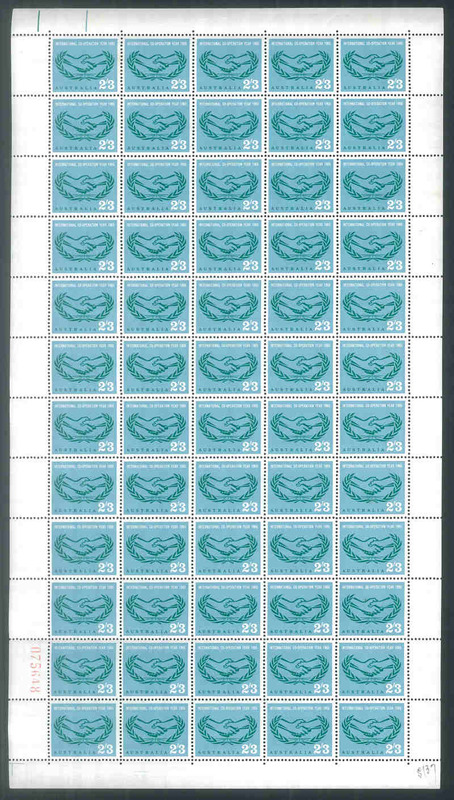 1972 Primary Ind set in sheets of 100 MUH and well centered. 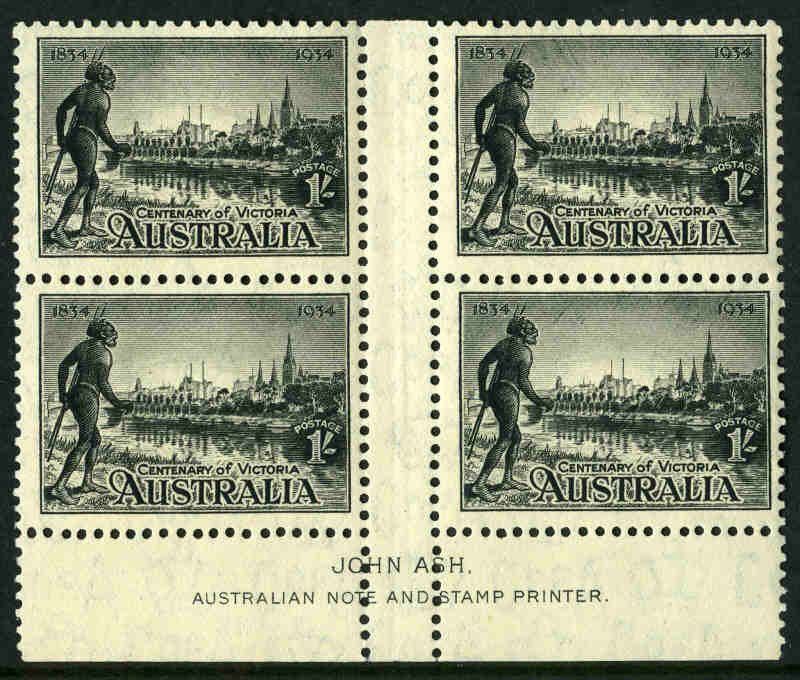 1977 $10.00 Painting marginal block of 4 with misplaced perforations, giving spectacular variety of "Australia" and "$10" at top of stamp instead of base MUH. ACSC 784ba. 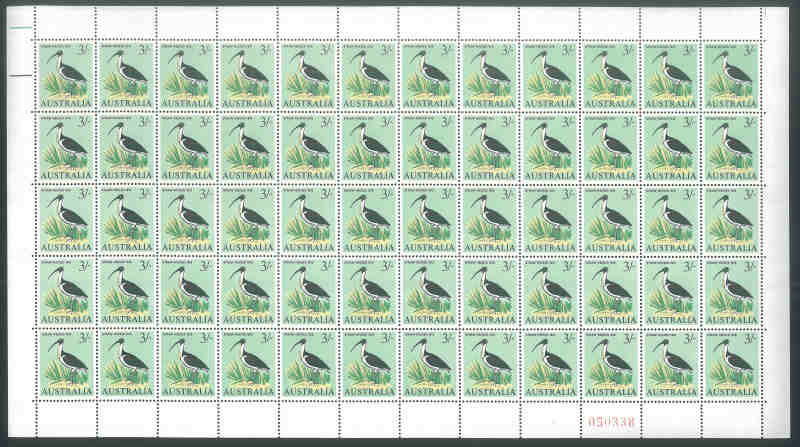 Comprehensive collection of 360 Koala and Kangaroo reprint stamps MUH from 1988 to 2010, including a few duplicates. Face Value $361.00. Retail $1,551.00. 1989 $3.90 Fishing booklet mis-guillotined on the diagonal so that when opened out the pane shows three separate "waves" MUH. 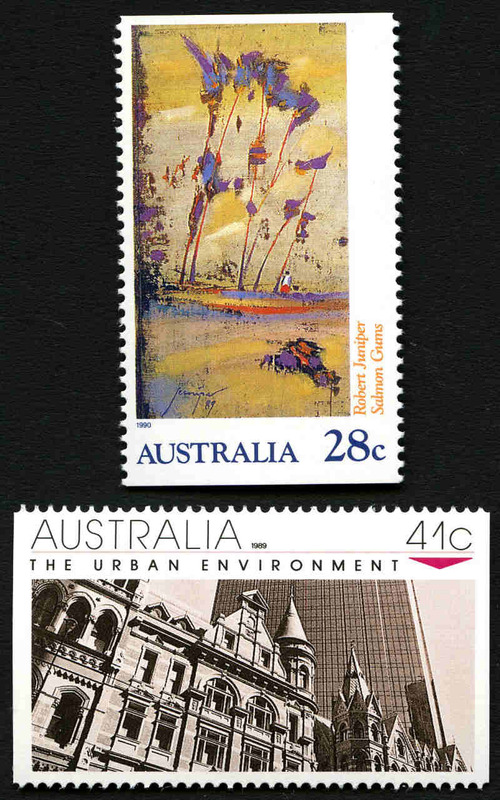 1989 Urban Environment and 1990 Heidelberg and Heritage sets MUH. (50 sets of each). Retail $275.00. Face Value $97.00. Complete set of Post Office Year Albums from 1981 to 1993, with extra 1986 album, a few without covers. Also 1980 Sherwood Year album, 1990-91, 1991-82 and 1992-93 Collector albums and a range of Post Office Heritage books. Face Value $633.00. 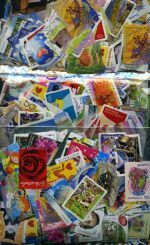 Complete set of Post Office Year Albums from 1981 to 1998, plus 2003 and range of POP's. Face Value $793.00. 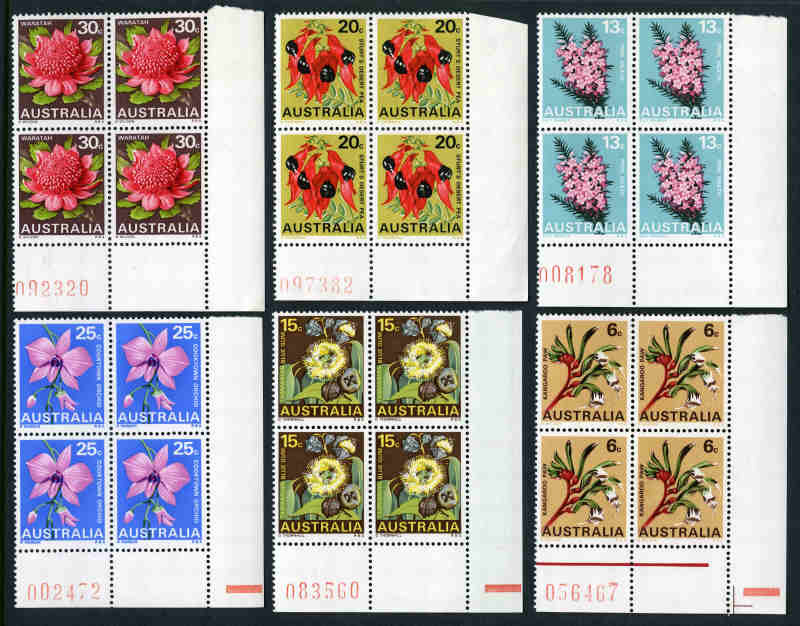 Also small range of FDC's and PSE's from 1987 to 1989. Complete set of Post Office Year Albums from 1981 to 2000. Face Value $721.00. 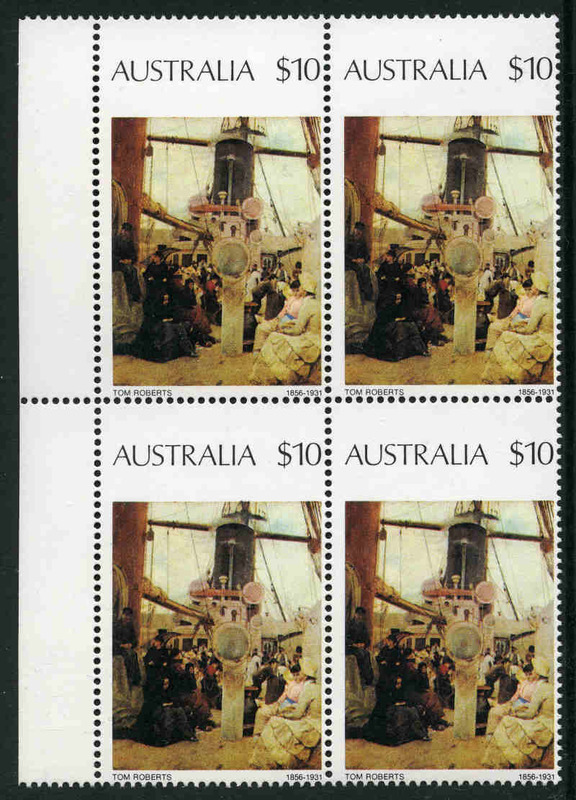 Complete set of Post Office Year Albums from 1981 to 2003, plus range of MUH stamps. Face Value $917.47. Also small range of miscellaneous items. 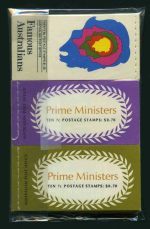 Complete set of Post Office Year Albums from 1981 and 1983 to 2003, plus additional 1987, 1990 and 1991. 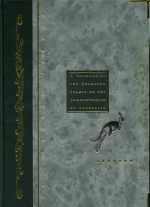 Also 1990-91 and 1992/1993 Collectors Year books, 2000 Golden Heroes book and small range of Bicenntenial Heritage books. Face Value $1,150.00. 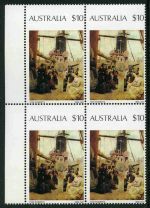 Complete set of Post Office Year Albums from 1981 to 2007. Face Value $1,162.00. Complete set of Post Office Year Albums from 1981 to 2009 excluding 2002. 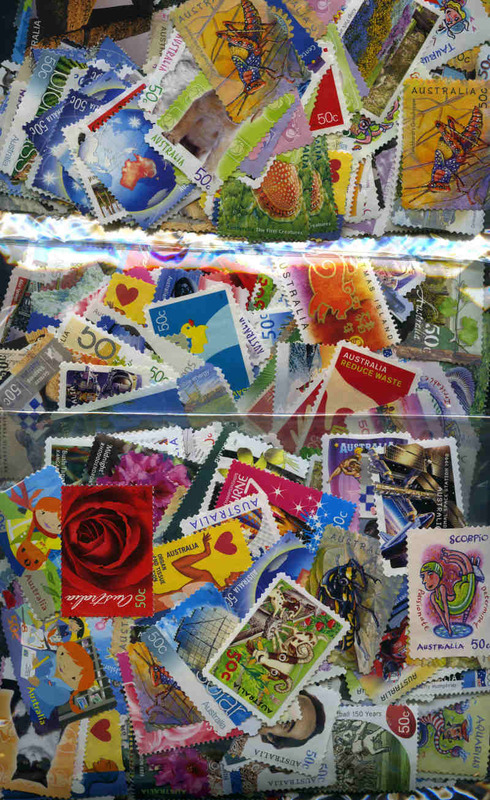 Also 1990-91, 1991-92 and 1992-93 Post Office Collectors Year Book containing Framas, Booklets and Self Adhesive stamps. Face Value $1,386.35. 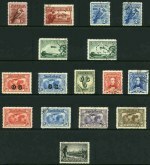 Complete set of Post Office Year Albums from 1981 to 2010. Face Value $1,443.00. 1982 (2), 1983, 1984, 1985 and 1986 Post Office Year Albums and 1990, 1993, 1994, 1995, 1996 and 1997 Leather Post Office Year Albums. Face Value $383.55. 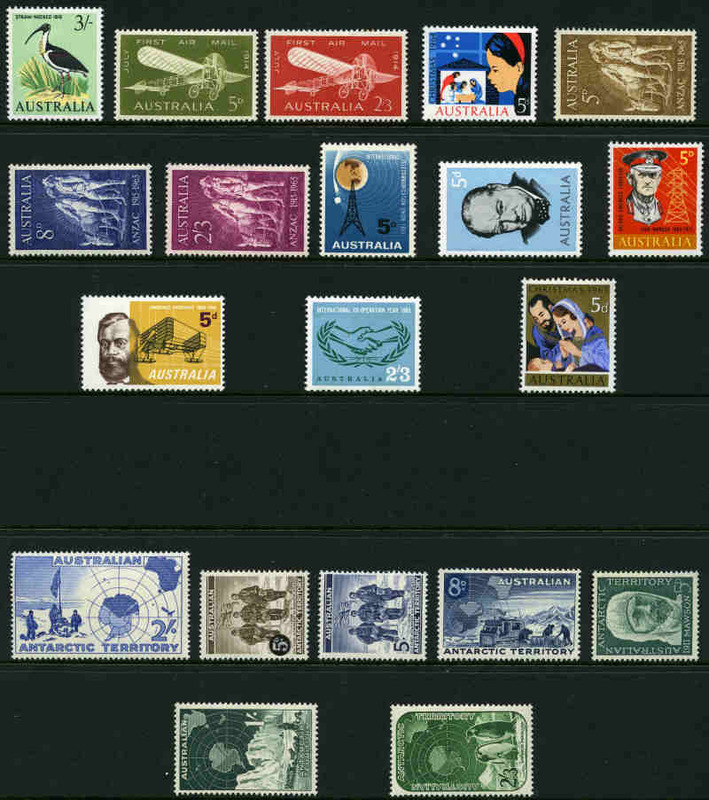 Complete set of Post Office Year Albums from 1982 to 2005, excluding 1994 and 1998. 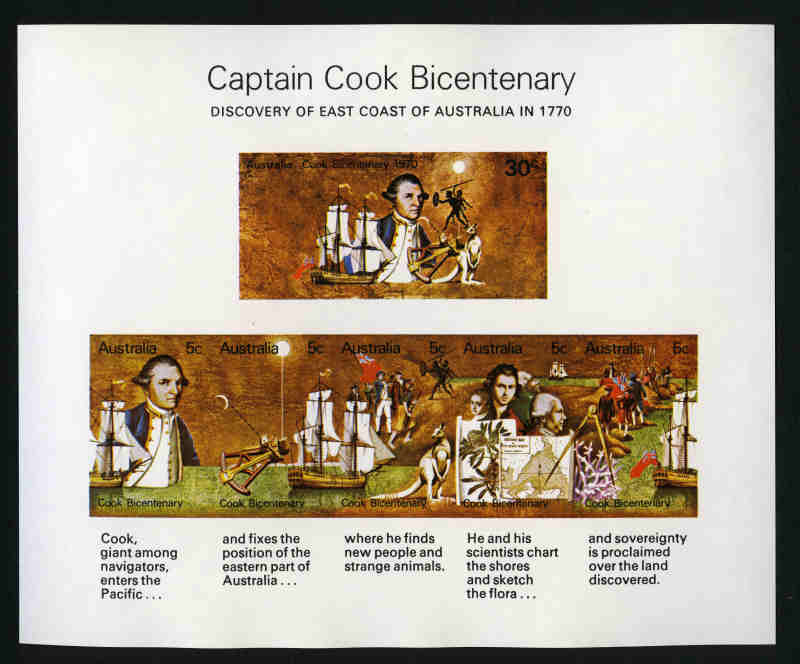 Also 1990-91 Collectors Year book, 1984-88 Bicentennial set of 5 Heritage books with extras, 1990 Antarctica Heritage book and 2000 Olympic Gold Medallist Sheetlet collection. Face Value $1,042.00. 1988 and 1989 Leather Post Office Year albums. Face Value $69.84. 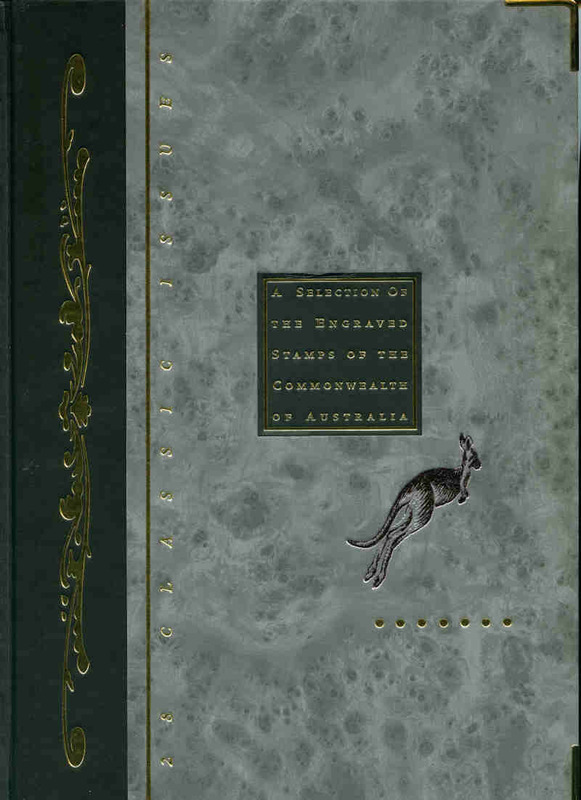 Complete set of Post Office Year Albums from 2000 to 2007, plus 2000 and 2004 Olympic Games and 2006 Commonwealth Games collections in special albums. Face Value $742.15. Collection of MUH Olympic and Paralympic Games sheetlets, gutter blocks and 2 booklets from 1996 to 2004 including 2000 Gold Medalist offset and digital sets of 16 sheetlets of 10 and 2000 and 2004 Gold Medalist sheetlets of 17. Face Value $581.85. Accumulation of MUH Decimal issues in Lighthouse stockbook. Face value $726.70. 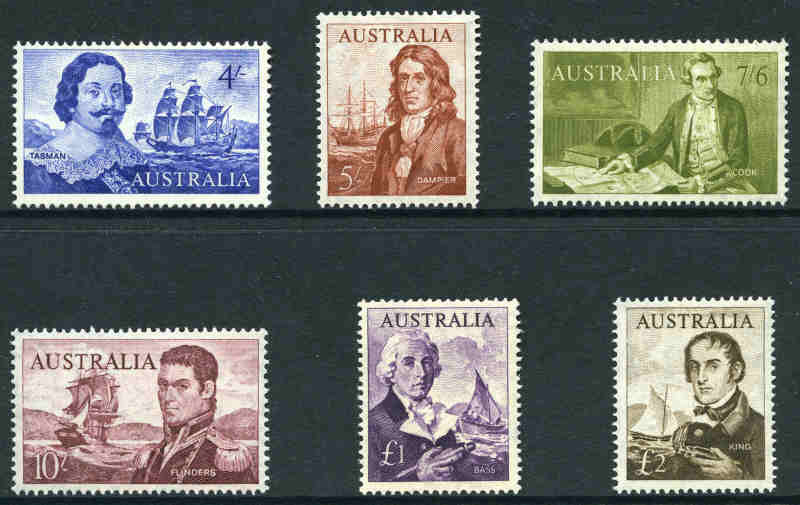 Also duplicated range of used Decimal stamps in 4 small stockbooks, plus Foreign collection of mostly used stamps in Lighthouse stockbook. 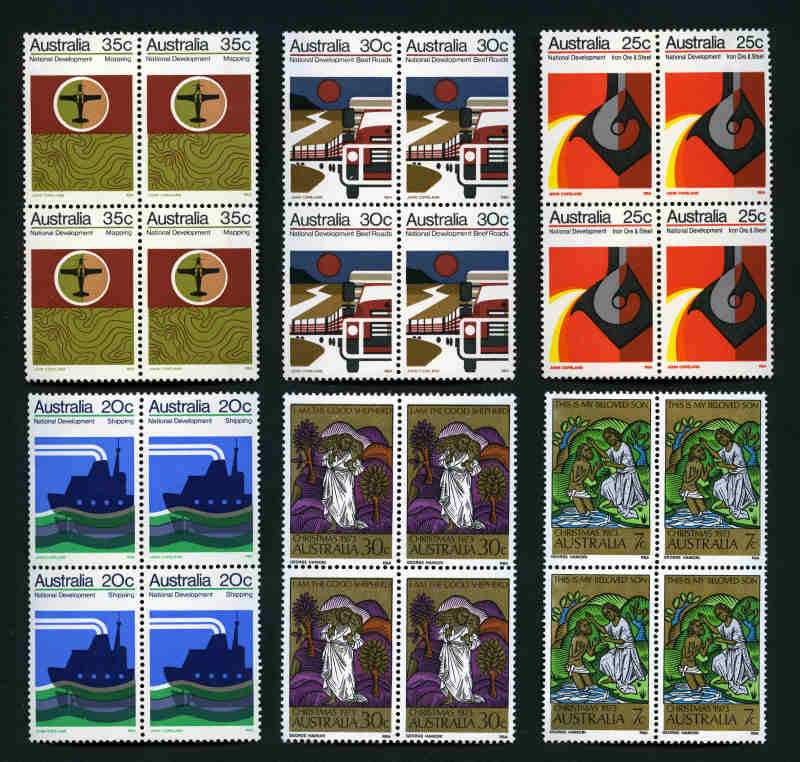 Collection of Post Office Packs from 1979 to 1997, plus 1981 Post Office Year album. Face Value $582.63. 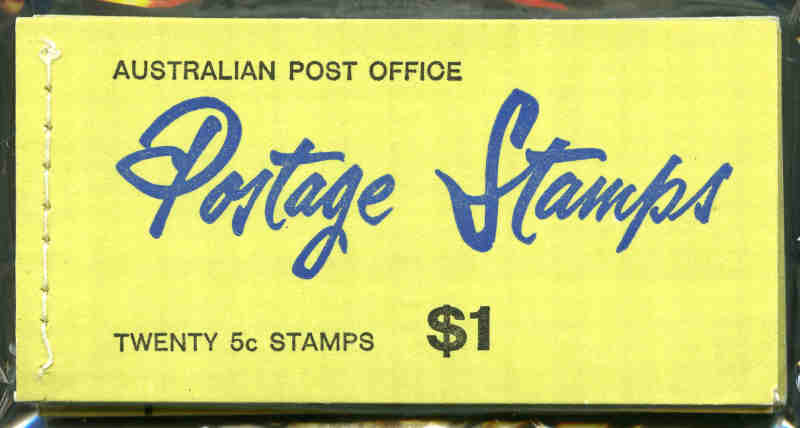 Also 261 mostly mint PSE's from 1978 to 1997 and 491 Maximum cards from 1986 to 1997 (Face Value $425.69), plus small range of miscellaneous items. 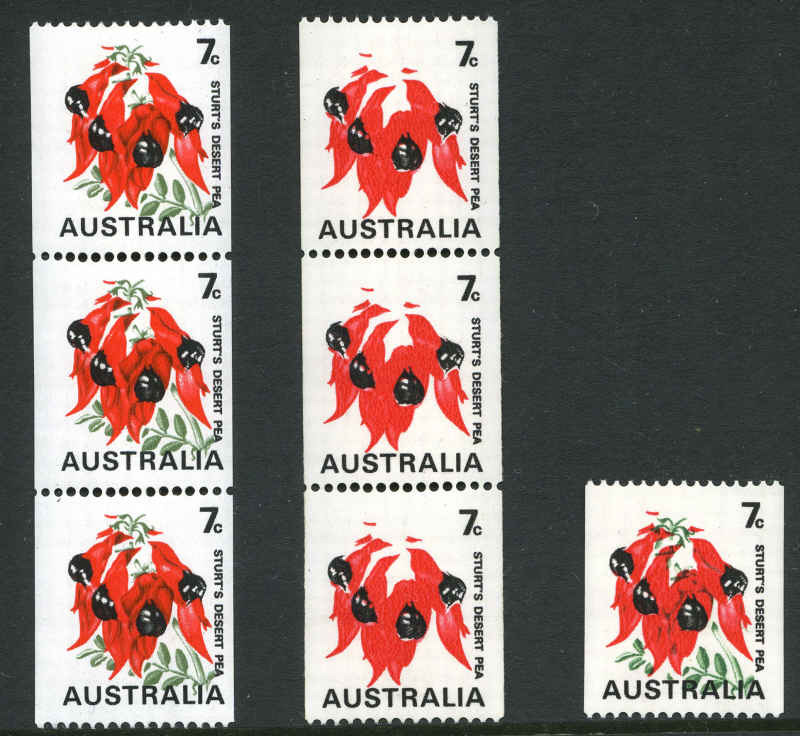 Accumulation of Post Office Packs. Face Value $763.00. Accumulation of MUH Decimal issues in Seven Seas Hingeless album, Hagner album and stockbook. Face Value $900.00. 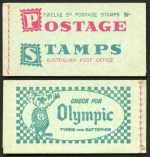 Also a range of other miscellaneous items including a few foreign items, collector cards and mint stamps without gum on piece (face value $59.00). Accumulation of POP's and range of MUH Decimal issues. Face Value $1,016.00. Accumulation of MUH Decimal issues, plus range of POP's from 1968 to 2010. Face Value $1,313.65. Selection MUH Decimal booklets from 1968 to 2008. Face Value $560.00. Collection of MUH Decimal issues from 1966 to 2008 in 3 Seven Seas Hingeless albums with slipcases. Face value $1,229.00. Selection of MUH Decimal issues. 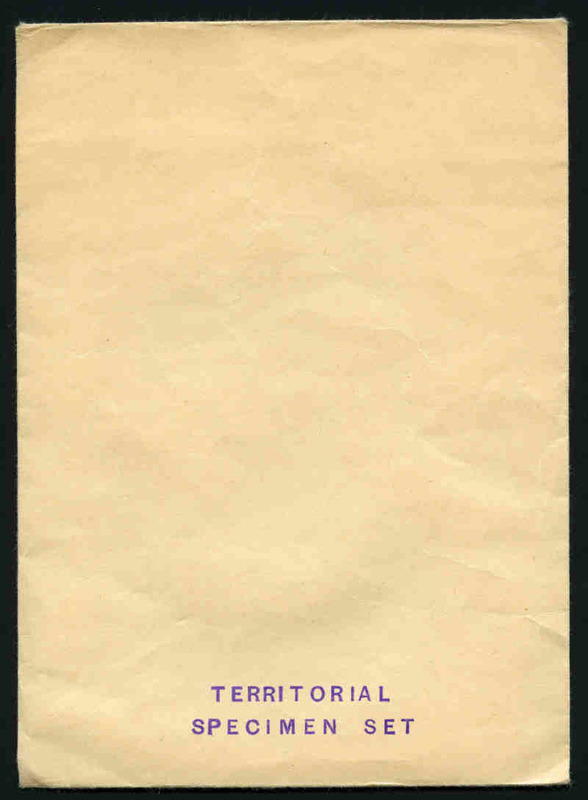 Noted 1966 $2.00 and $4.00 Navigators in half sheets of 50. Face Value $488.00. Accumulation of MUH Decimal issues including booklets. Some light toning. Face Value $1,568.00. Accumulation of MUH Decimal issues from 1966 to 2008, mainly on Hagner sheets in 7 albums. Some early issues hinged. Face Value $3,604.00. 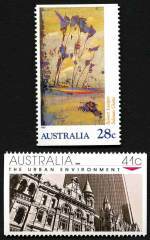 Australian Antarctic Territory 1966 to 2007, Christmas Island Australia and Cocos (Keeling) Islands Australia 1993 to 2008 MUH. Face Value $805.00. 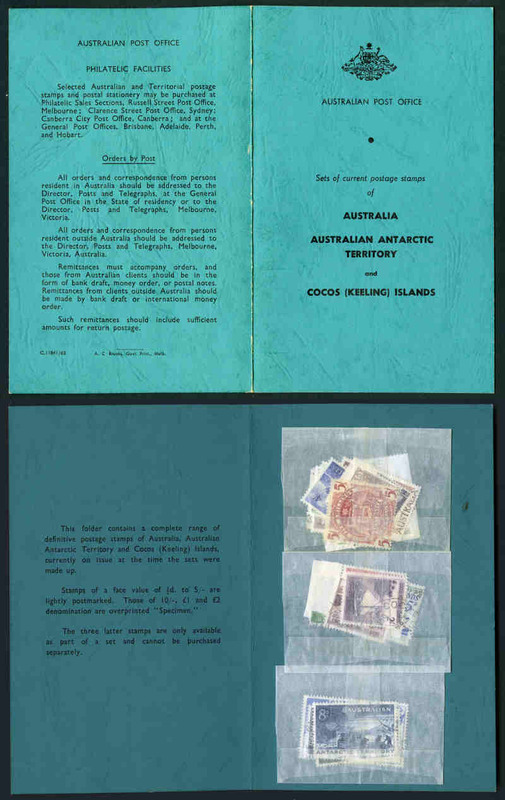 Accumulation of hundreds of Post Offices Packs including some Australian Antarctic Territory and Christmas Island Australian issues. Face Value $857.00. 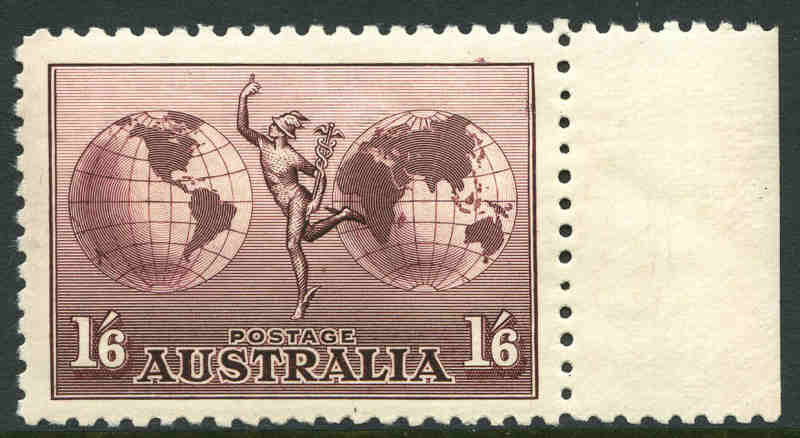 Accumulation of MUH Decimal issues including Australian Antarctic Territory, Christmas Island Australia and Cocos (Keeling) Islands Australia. Face Value $1,144.00. 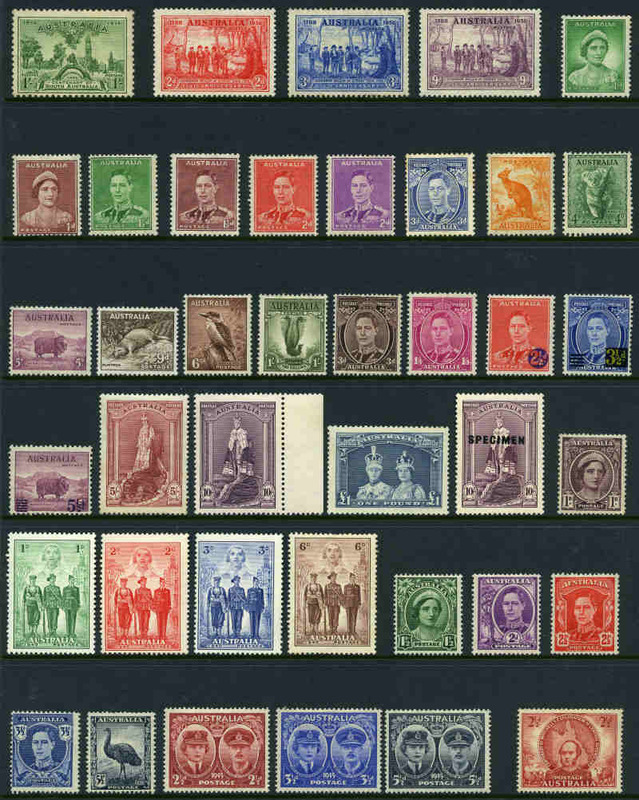 Accumulation of MUH Decimal stamps including some booklets. Face Value $2,025.00. 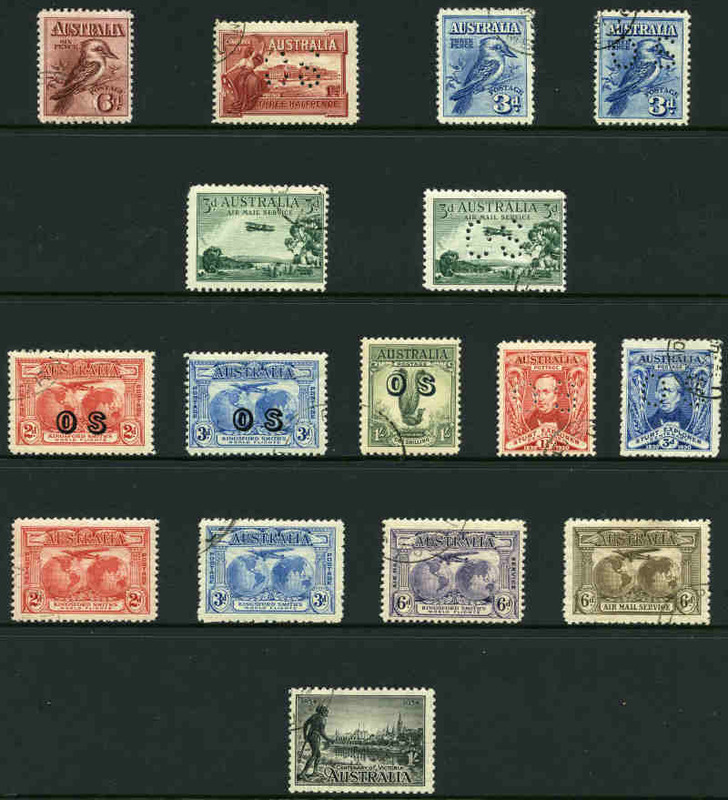 Accumulation of MUH Decimal stamps, plus range of POP's. Face Value $552.00. Selection of POP's. Face Value $81.28. Also range of official unaddressed FDC's and PSE's. 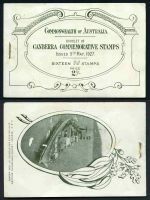 Selection of booklets with a face value of $144.70. 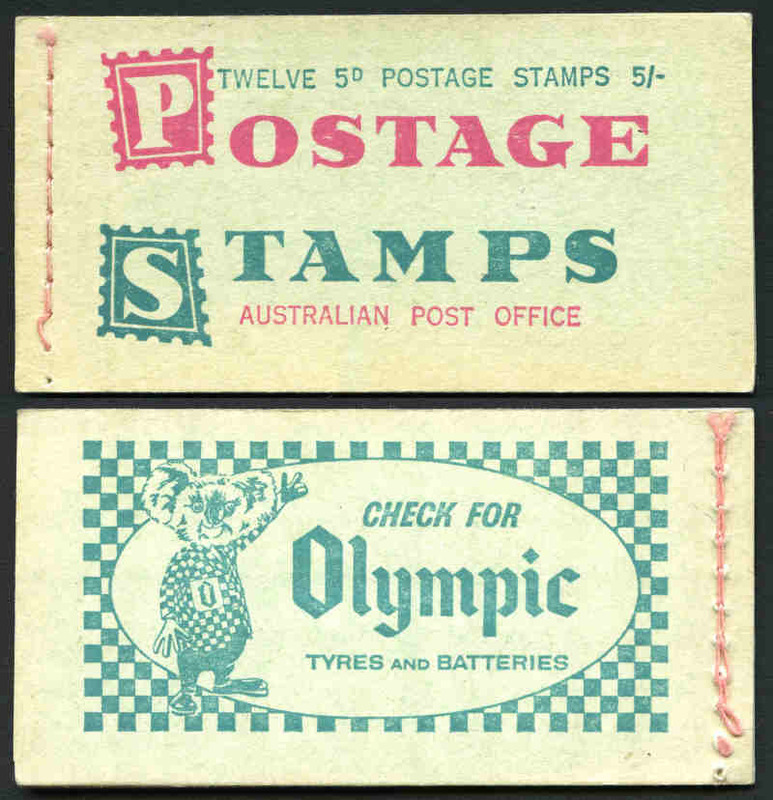 Some booklets have between 1 and 4 stamps cancelled on the First Day of Issue, but uncancelled stamps in the booklets have a Face Value of $134.41. 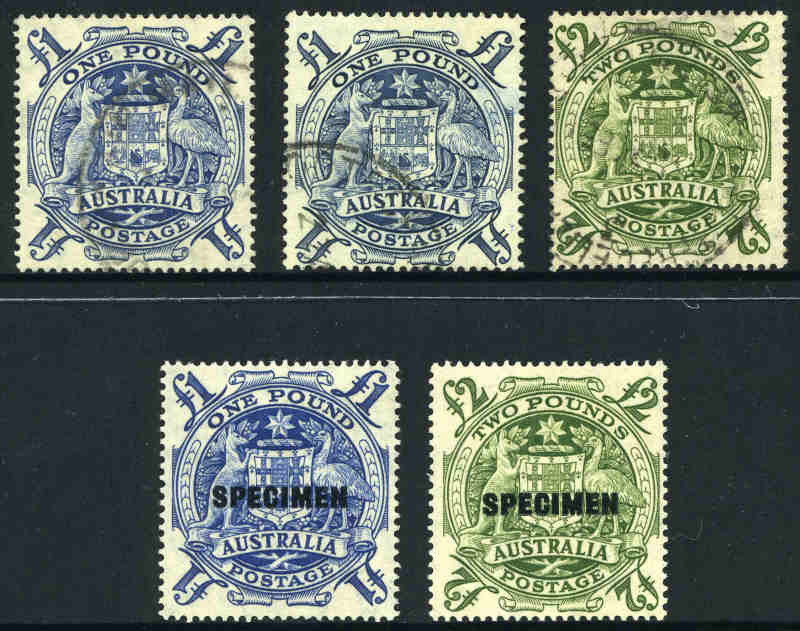 Selection of MUH Decimal gutter blocks of 10 and sheets, plus range of POP's. Face Value $1,258.51. 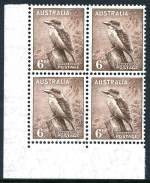 Also selection of MUH low value Pre-Decimal issues, small range of covers and 1981 Brown (3) and 1982 Black (4) Postcard packs. Accumulation of MUH Decimal issues. Some with light toning. Face Value $501.00. Accumulation of MUH Decimal issues, plus range of POP's. Face Value $1,654.00. Accumulation of MUH Decimal issues including booklets. Face Value $987.00. Accumulation of MUH Decimal issues including some booklets, POP's and 1981-1984 Post Office Year albums. Face Value $3,425.00. Accumulation of MUH Decimal issues from 1996 to 2009. Face Value $844.00. 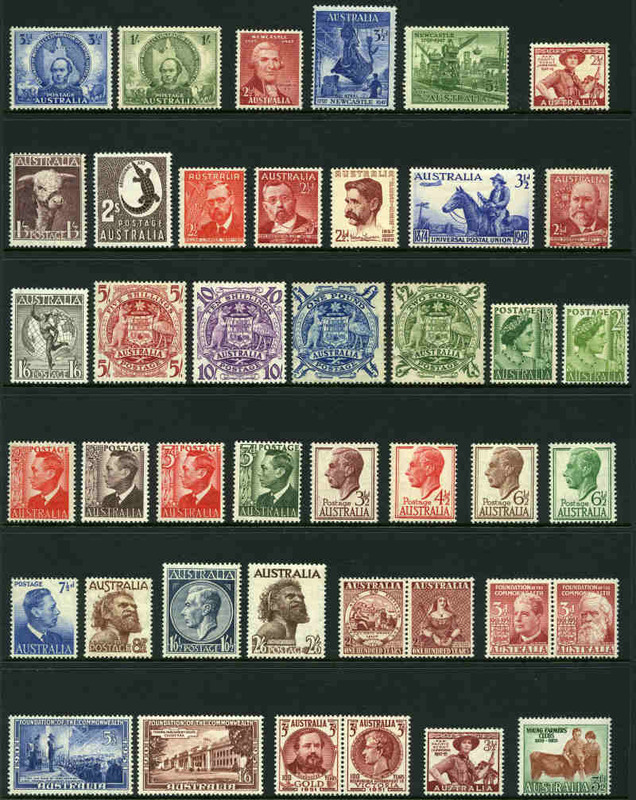 Also used Decimal collection from 1966 to 1996 on Hagner sheets. Accumulation of MUH Decimal issues including a few handy earlier issues and some booklets. Face value $230.00. 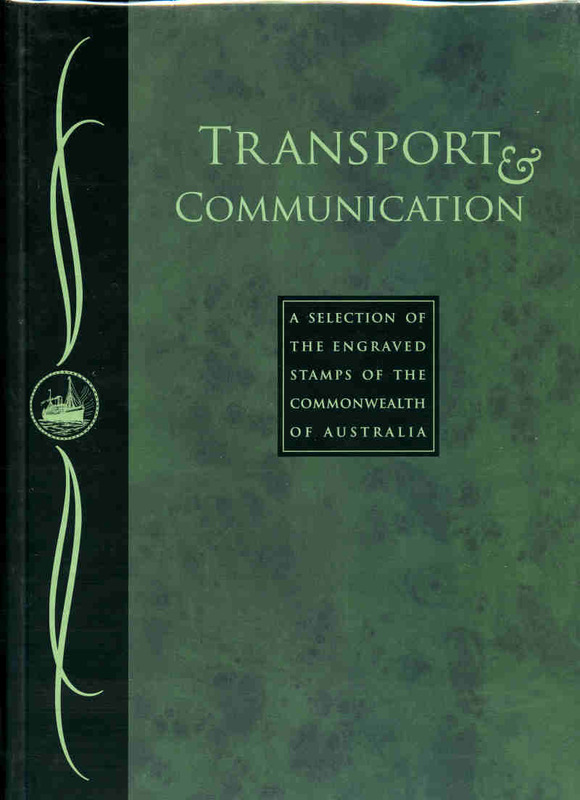 Accumulation of MUH Decimal stamps in 2 stockbooks with a few handy items in 2 stockbooks. Face Value $284.00. 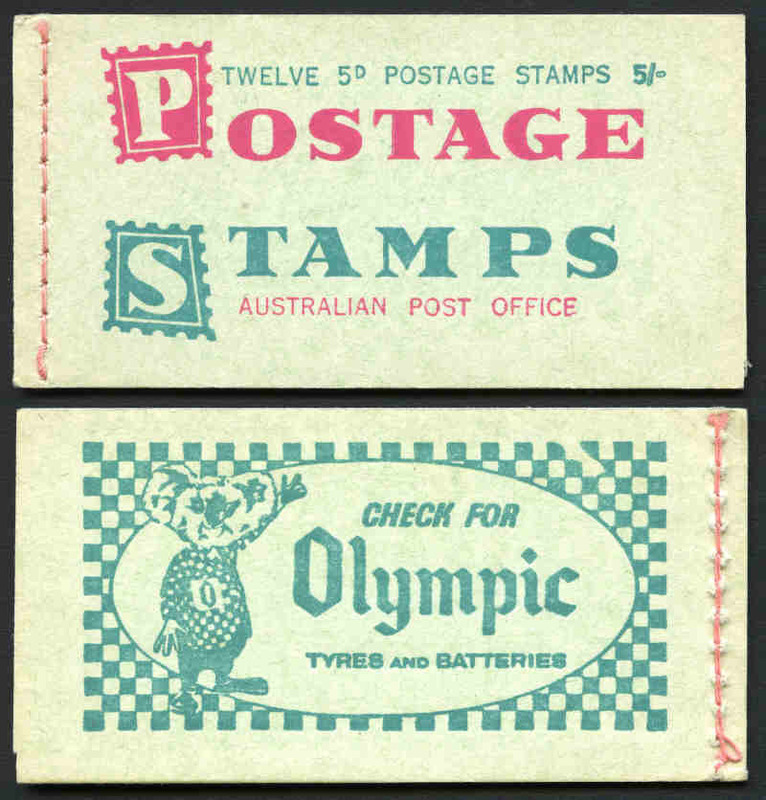 Also some used stamps and FDC's not included in the face value. 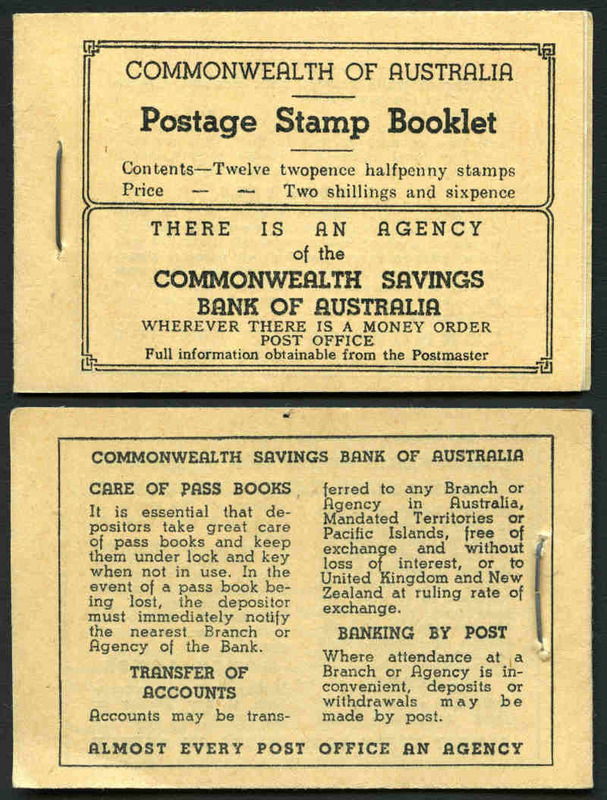 Accumulation of MUH Decimal issues including several booklets. Face Value $537.00. 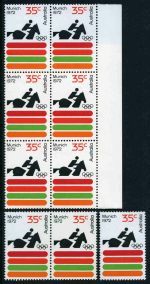 Accumulation of MUH Decimal stamps including Post Office Packs, 1981 Post Office Year Album, 2000 Olympics sheetlets album, booklets and more. Face Value $1,394.00. 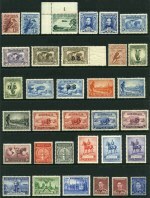 Selection of 66 different Prestige booklets from 2005 to 2010. Face Value $719.12. 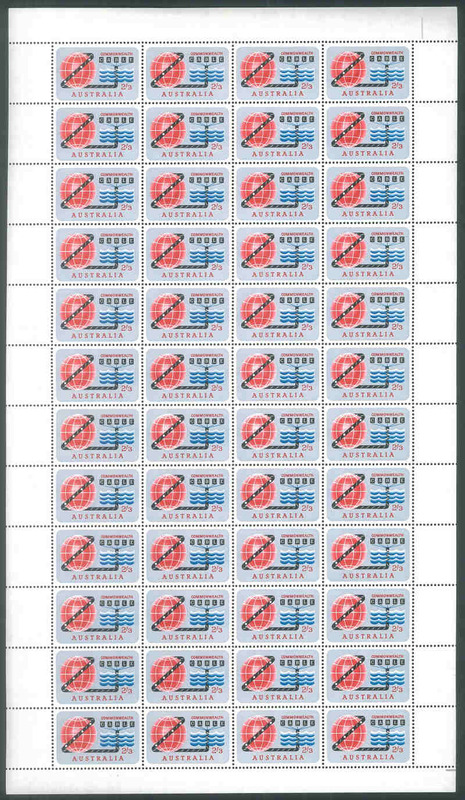 Accumulation of stamps mint without gum, comprising various values to 60¢. Face Value $500.00. Accumulation of 45¢ x 52, 50¢ x 480, 55¢ x 614, 60¢ x 157, plus a small range of other values on piece mint without gum. Face Value $709.00. 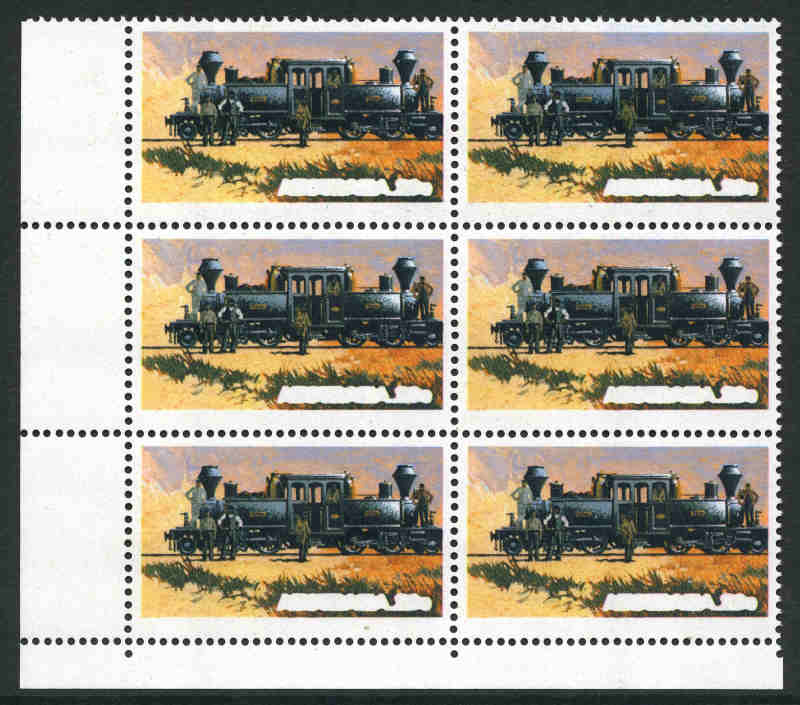 Accumulation of stamps on piece, mint without gum. 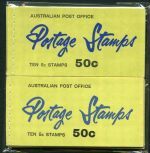 Mainly 45¢, 50¢, 55¢ and 60¢ values, but includes some higher and lower values. Face Value $373.00. 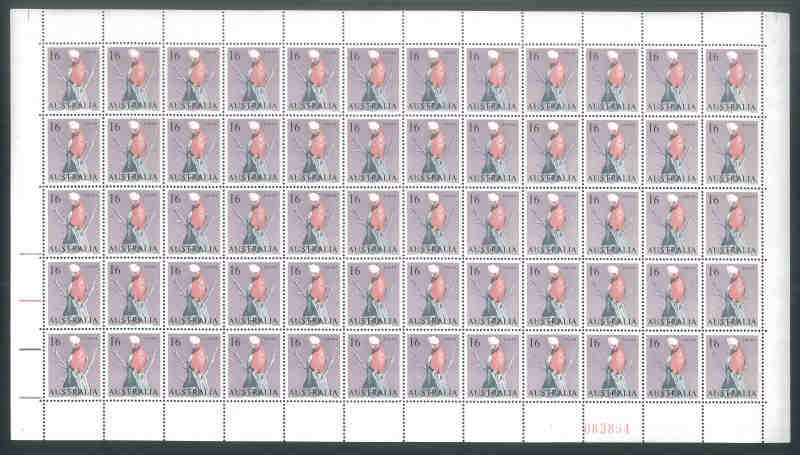 Accumulation of 2,200 50¢ and 3,900 55¢ stamps mint without gum. A very small proportion (5%?) noted with minor faults, typically small tears or creases. Face Value $3,245.00.